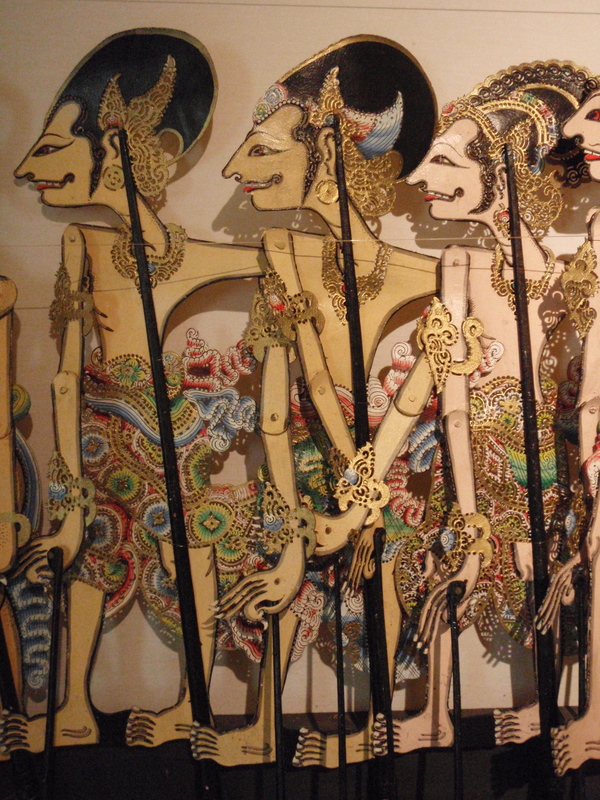 Wayang is the traditional theatre of Java, Sunda (West Java), Bali, Lombok, Sumatra, Kalimantan in Indonesia and Malaysia that have been influenced by Javanese culture. 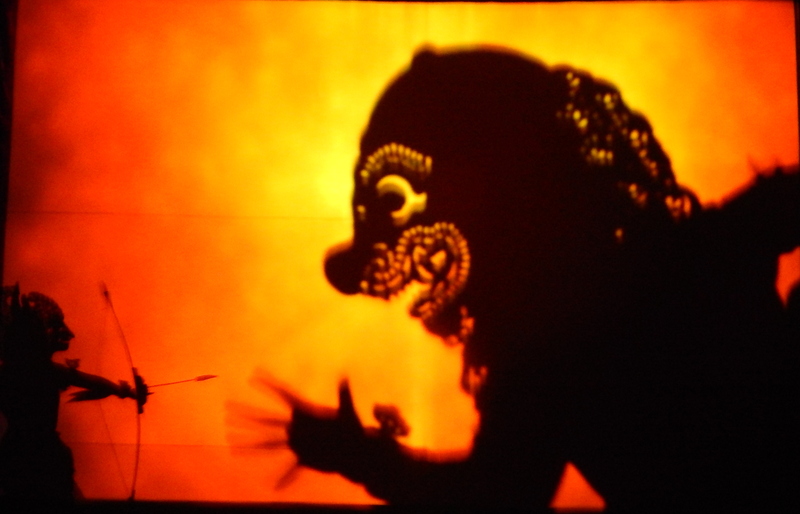 The term wayang is usually said to come from bayang (shadow), and shadow theatre puppetry is considered the model for other forms of this puppet, mask or dance performance. 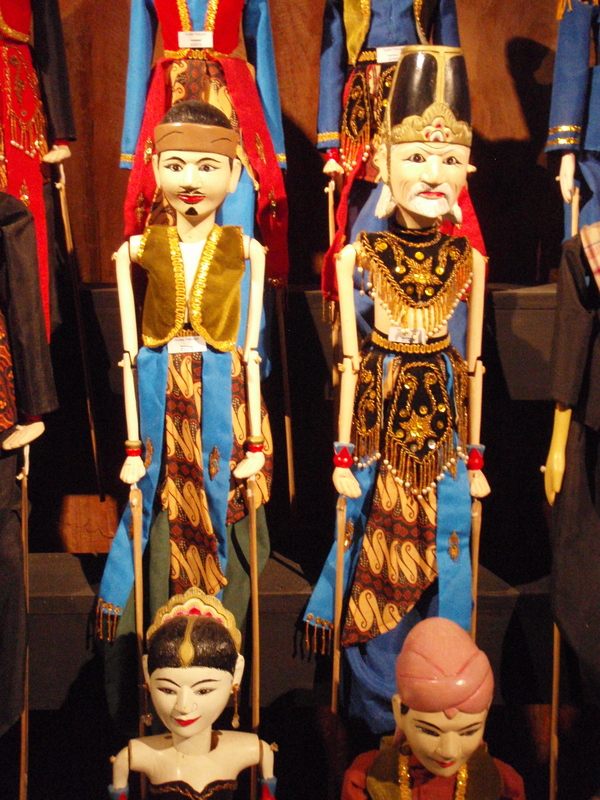 Traditional theatre is modelled on puppetry which is considered the elder art. 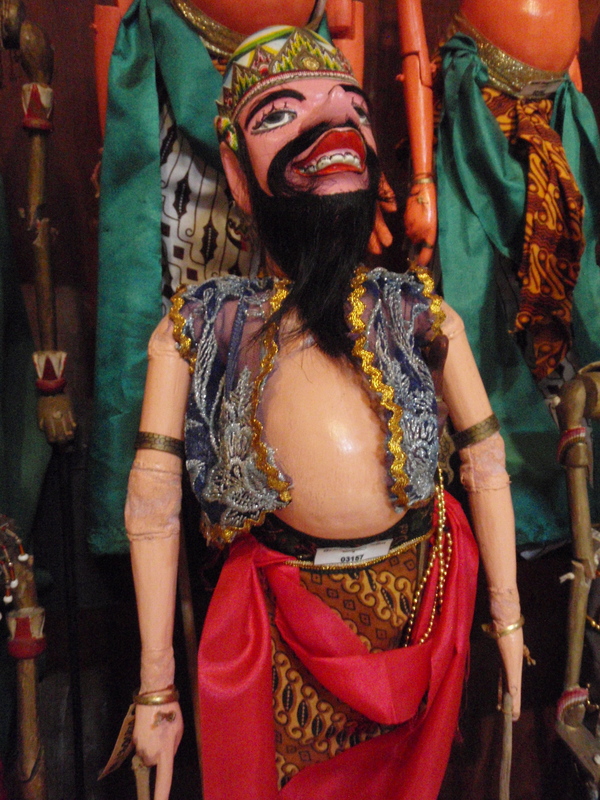 Local theatre therefore depends on a dalang (dhalang in Javanese), a puppet master/story teller who shapes the overall performance. 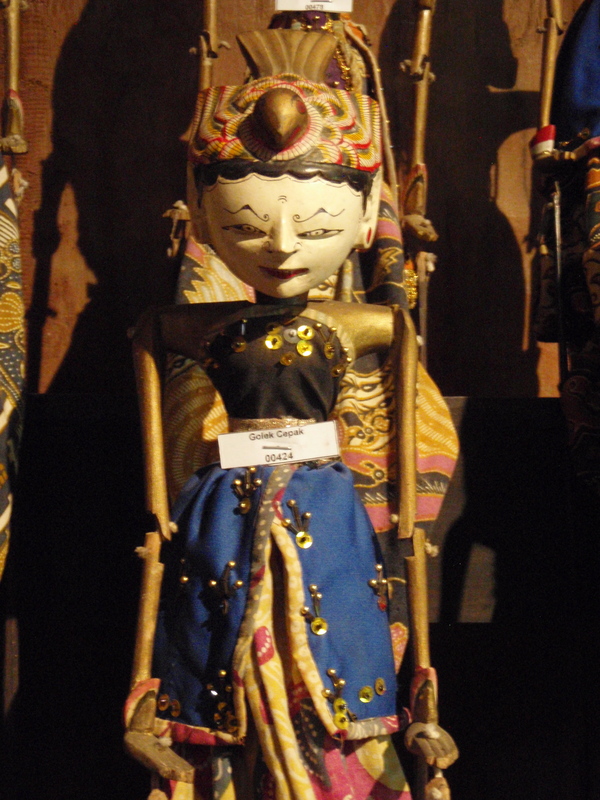 The dalang delivers narration, controls the gong chime orchestra, usually called a gamelan, and normally delivers all the dialogue, as well as moving all the figures. He (or sometimes she) is also responsible for singing mood songs, reciting mantra that safeguard the performance, and infusing humour into the tale. 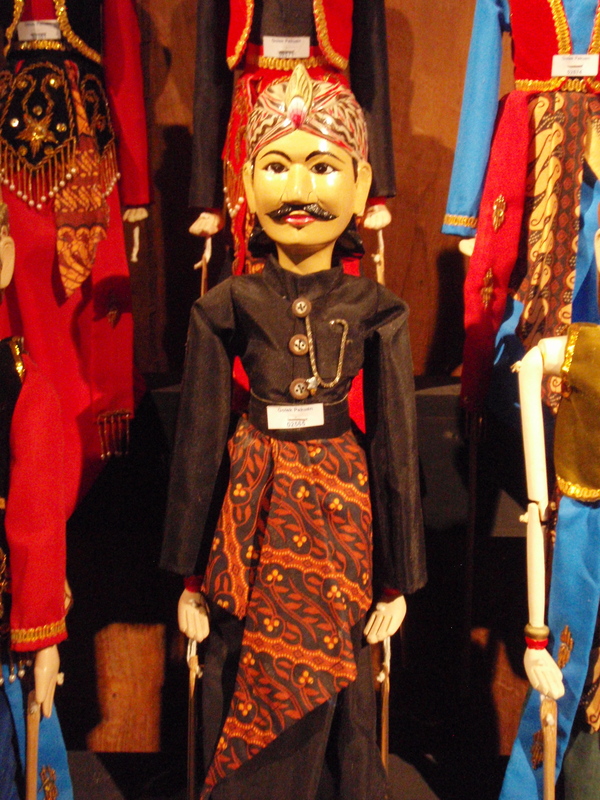 He cues the orchestra with taps on the wooden puppet chest. If the story uses actors instead of puppets, these dancers make their own choreographic choices and, sometimes improvise their own dialogue. 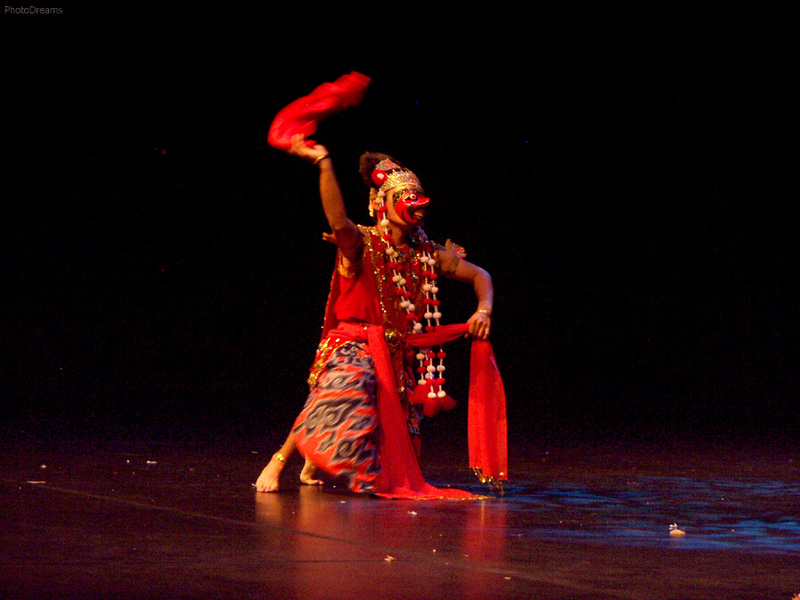 But dancers must follow the dalang‘s improvised narrative. 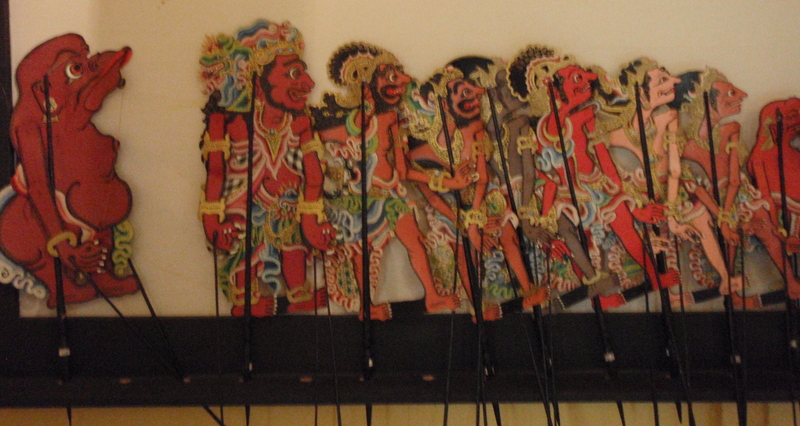 Dancers are wayang orang, “human puppets”, in his show. 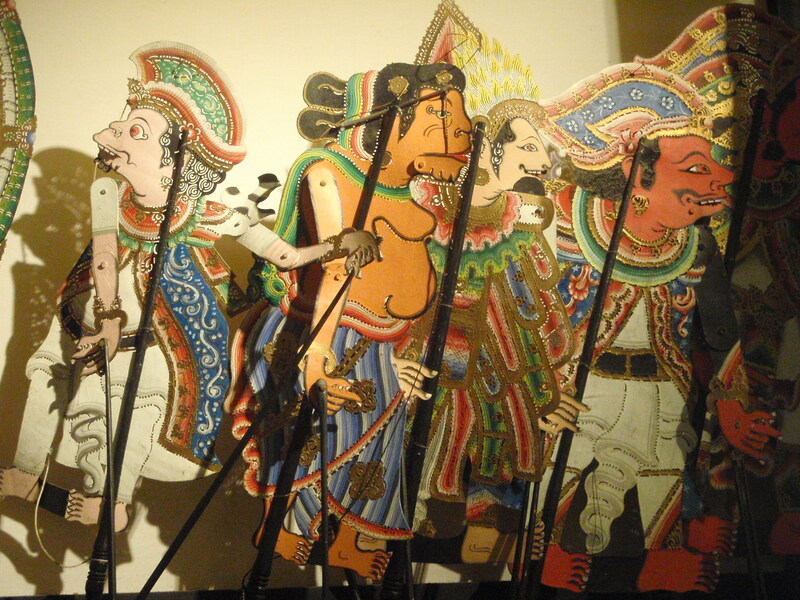 Perhaps because the point of origin of traditional theatre is a solo puppet master, the wayang is a theatre of stylization where a single person can represent many different characters by rules of type. While in different areas the names of the types will be slightly different, the major recurring types are refined male (alus), refined female (putri), strong male (gagah) and demon (denawa). 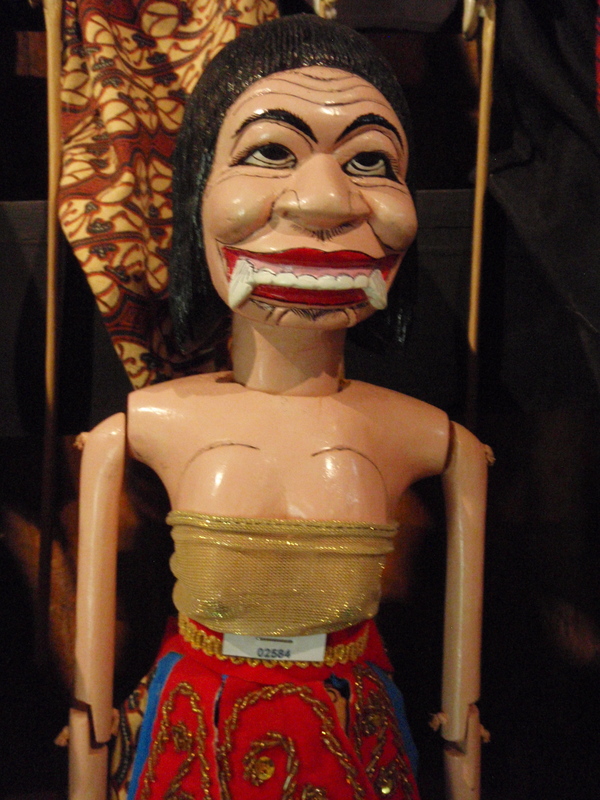 A fifth group is the clown (panasar in Bali, punakawan in Java). The refined character will often have a white face and be associated with the noble or divine. 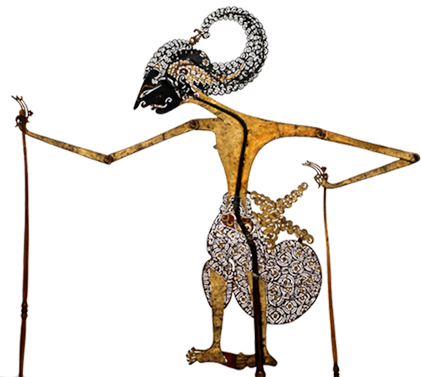 Narratively, this character is the refined hero: Rama in the Ramayana, Panji in legendary stories of Java, Arjuna in the Mahabharata. 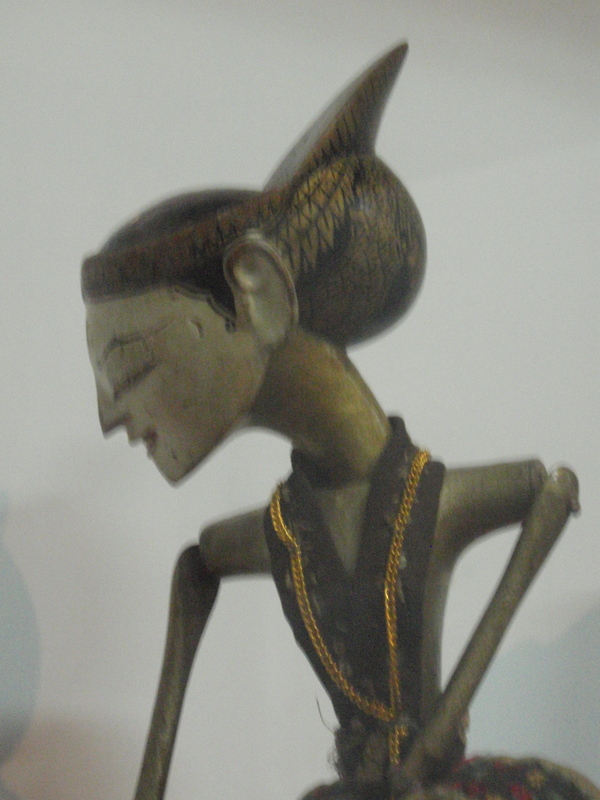 The principle female (putri) is a heroine like Sita, the wife of Rama, Candra Kirana, the beloved of Prince Panji, or Sumbadra the wife of Arjuna. 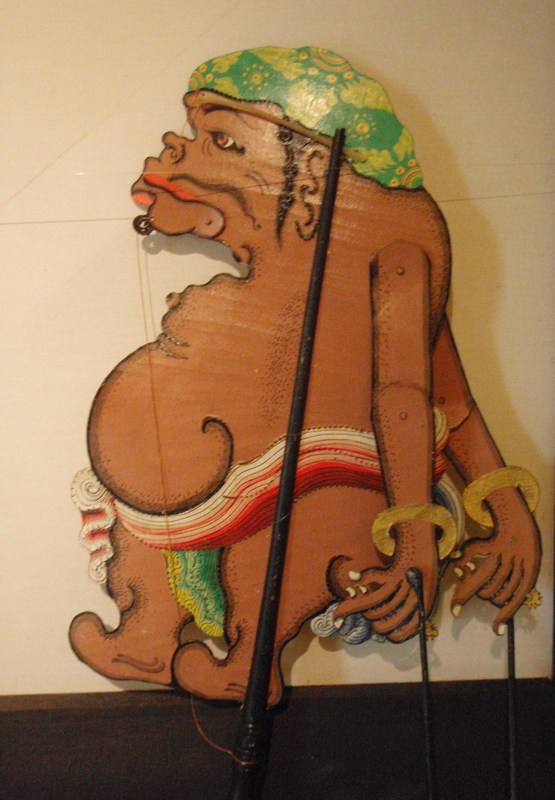 The strong character represents the active male principle and is typified by Hanuman the monkey general in the Ramayana, Tumenggung the strong prime minister in Panji stories, and large, straight-talking Bima (the second of the five Pandawa brothers) in the Mahabharata. The ogre has associations with the underworld and death and functions as the antagonist or villain. 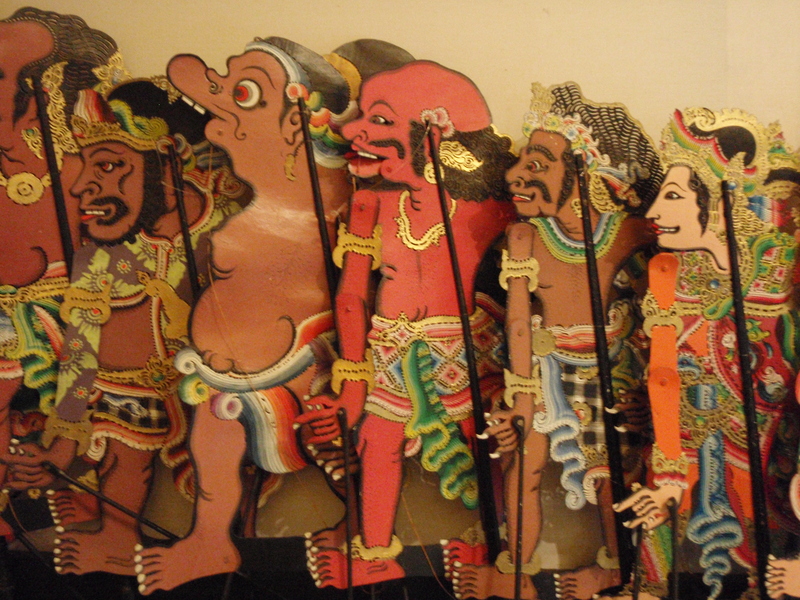 Examples are Rahwana (Ravana in India) in the Ramayana, Kelana in Panji stories, and Dursasana in the Mahabharata. 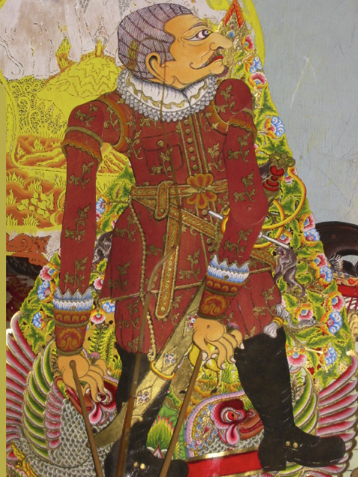 The clown, of divine origin but low class, is an androgyne. 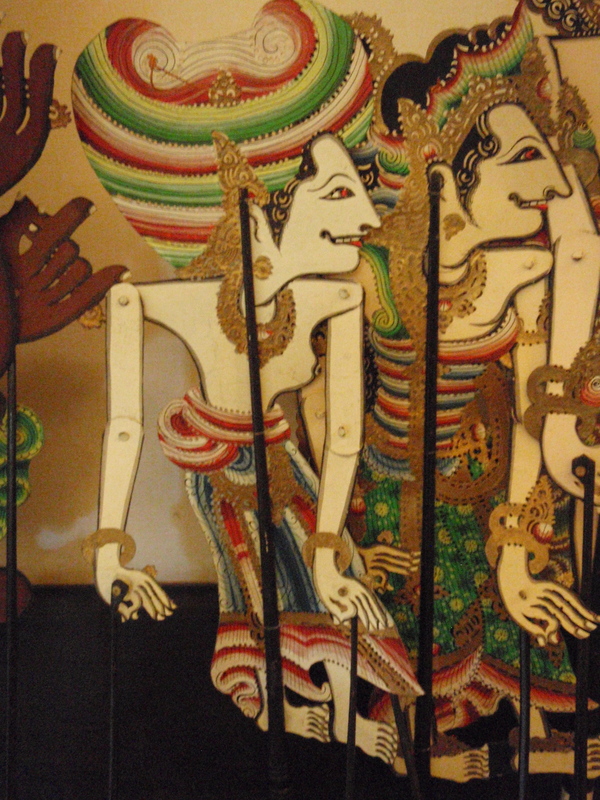 He (Semar) combines female and male, human and divine, and is, conceptually, a mix of all of the other energies. 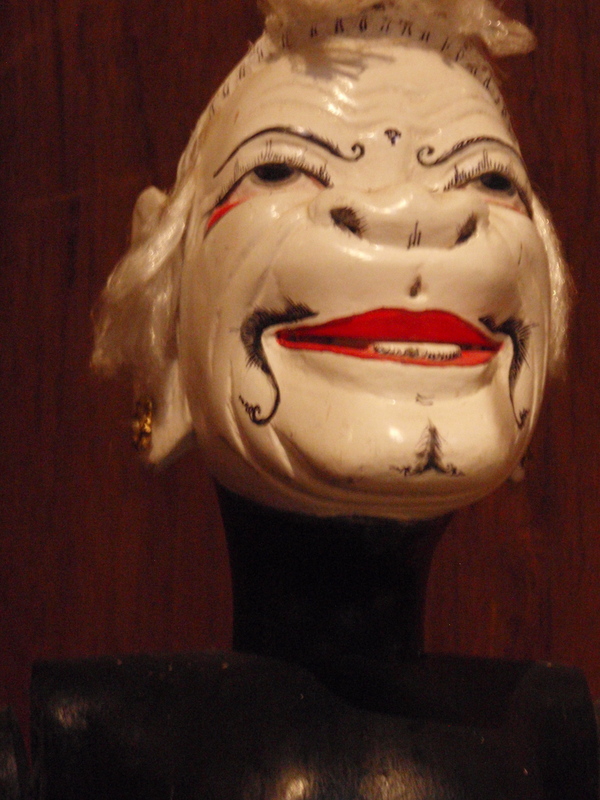 The clown is associated with the centre and the performer’s self. 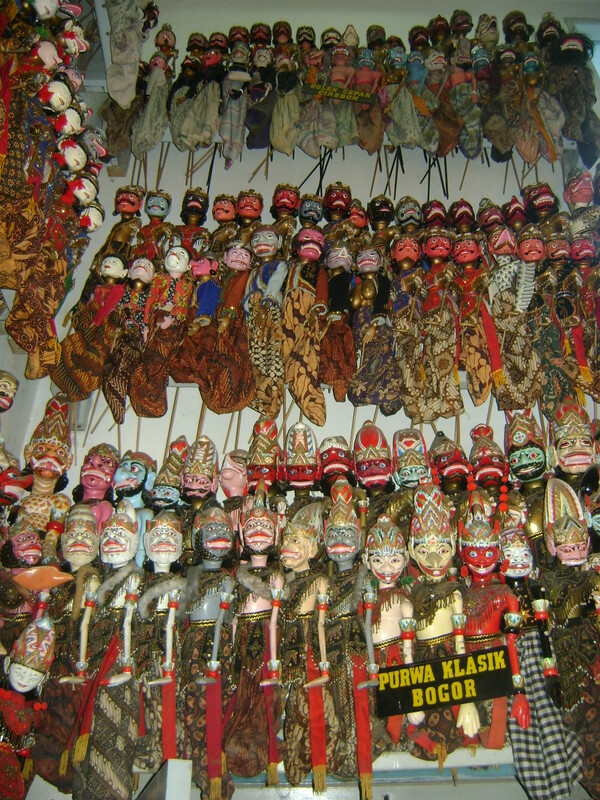 Typology is both very pragmatic (creating specifics of how a character’s voice is sounded or with what energy a dance movement is executed) and rather esoteric (along the north coast of Java the different types are associated with different compass points, ages of life, or elements – earth, water, fire, air). The system is probably an outcome of the fact that this is a solo theatre form. Performers codified the different sounds and movements possible in the normal human body so that each type will be distinct. For example, refined characters use a low note and by a manipulation of the throat make it wider inside to create a pleasing resonance, while ogre kings use a higher and changing notes and a combination of nasal and chest resonators. 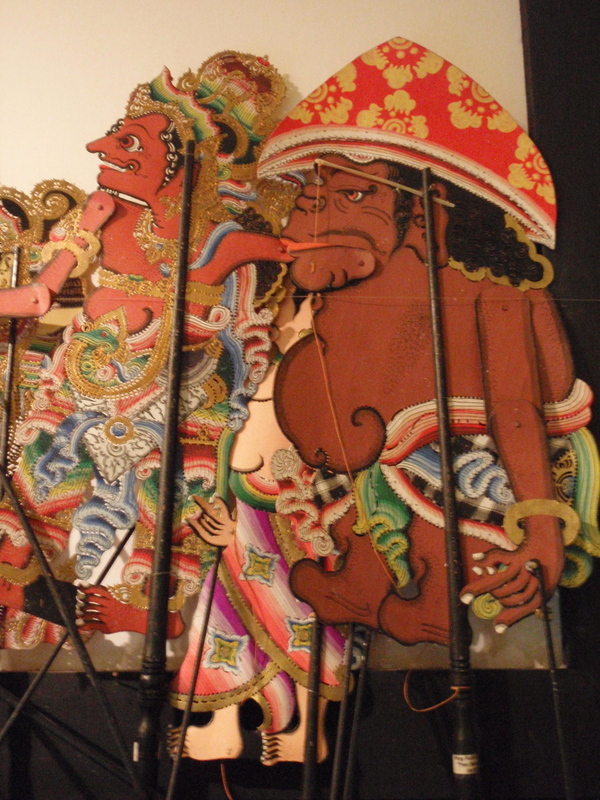 Refined characters will be danced with the right hand which is capable of grace, while the ogre character is on the dalang‘s left hand – the literal jerkiness will reveal he is a jerk. 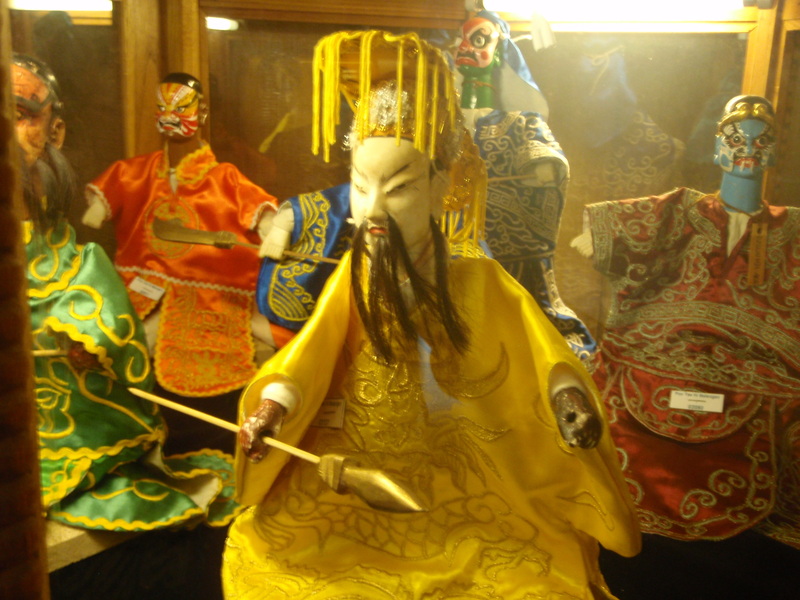 In its most complex iteration the practice of puppetry gives the performer access to a philosophy, which teaches that behind the apparent multiplicity of the cosmos is a unitary force, which merely manifests itself in different ways. 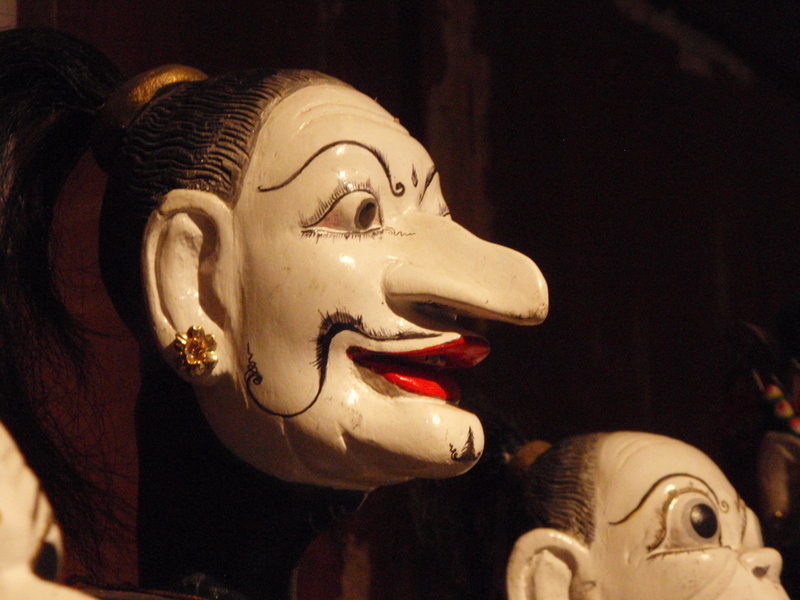 The clown (the god clown Semar in Java and Sunda, Twalen in Bali) is the character which is closest to the dalang‘s own persona. 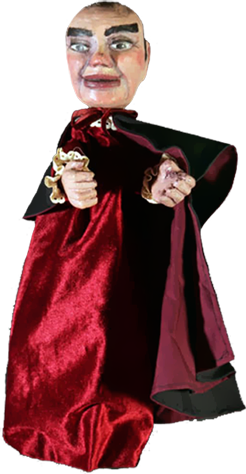 This clown is both the high god of the universe descended to earth and the lowliest of men, a servant to the hero. An androgyne, he is both mother and father of his sons. While he participates in the world of the story, his jokes deal with what is going on in contemporary life. 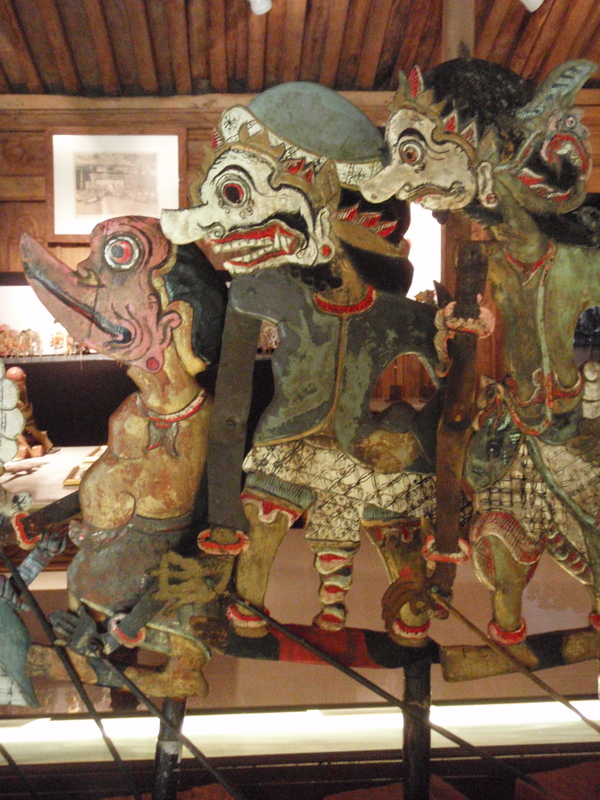 Some scholars link the clown with transvestite shamanic traditions of the archipelago that may have given rise to groups like the bissu of Sulawesi. The clowns may have developed from a tantric philosophy wherein male and female components latent in each person must be “married” for the enlightened soul to emerge. This clown is clearly connected to rituals and exorcisms. 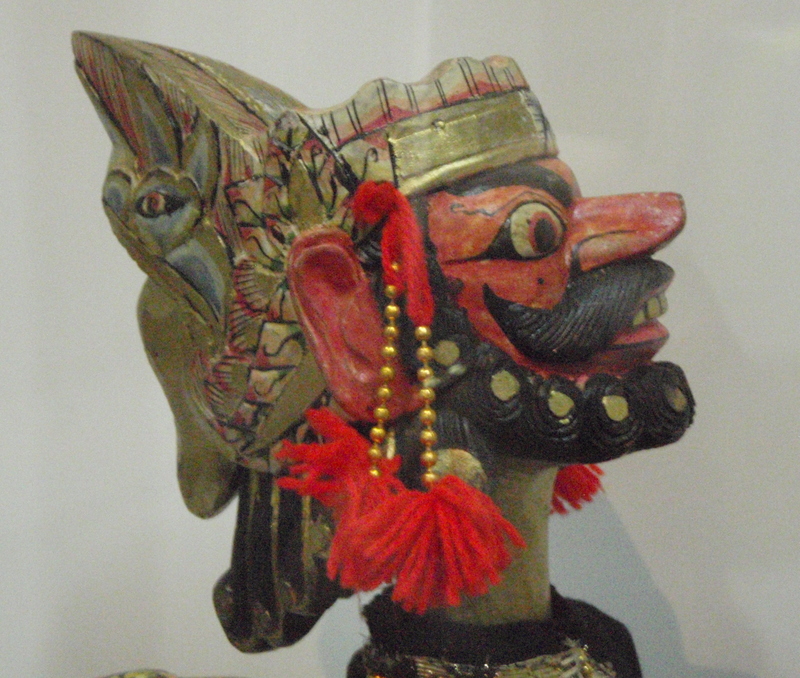 It seems possible this character is linked to traditions like the bauls, the counter culture clown-mystic-singers of Bengal, India, and both dalang and baul are related to medieval Hindu sects like the Shaivite pasu-pata: initiates would use clownish and outrageous social behaviours as a path toward religious enlightenment. 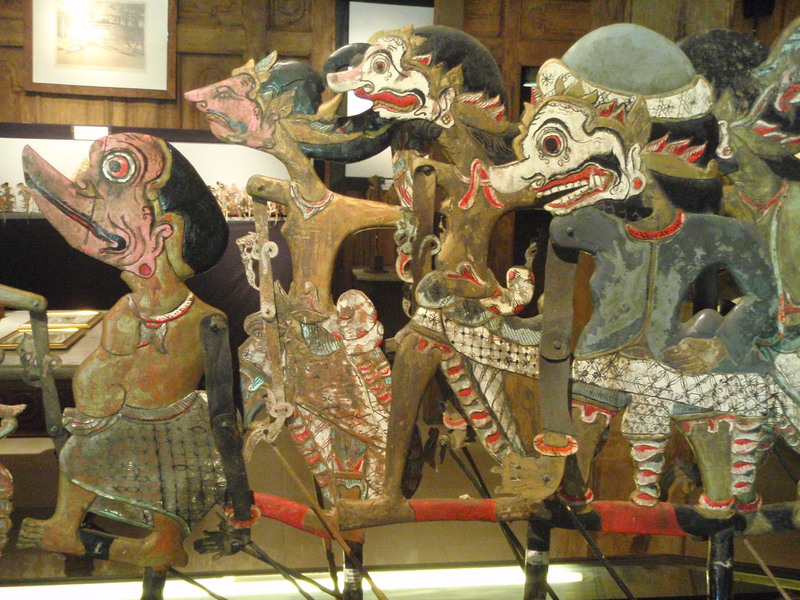 Such sects used the performing arts as a tool to spread their teachings and their presence is documented in Java in the 8th to 15th century Hindu-Buddhist period. 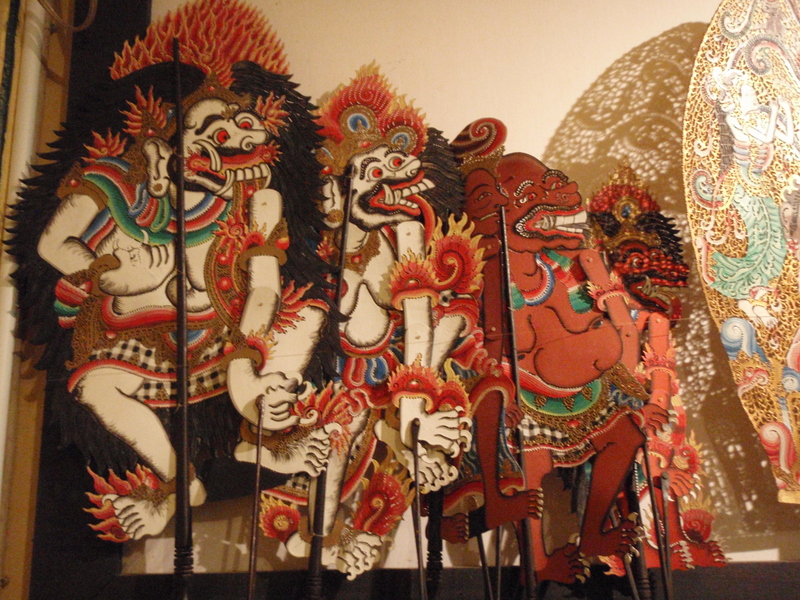 Music and its visible manifestation, dance, are central to wayang performance. 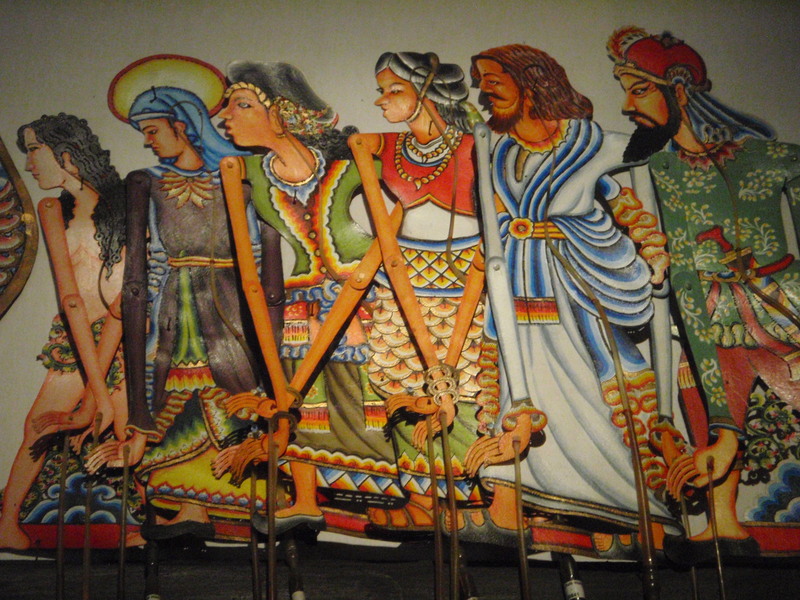 Drums are used to create sound effects, accompany the dance movements, and to convey the dalang‘s orders to change tempo to musicians. Orchestras are primarily metal percussion instrument. 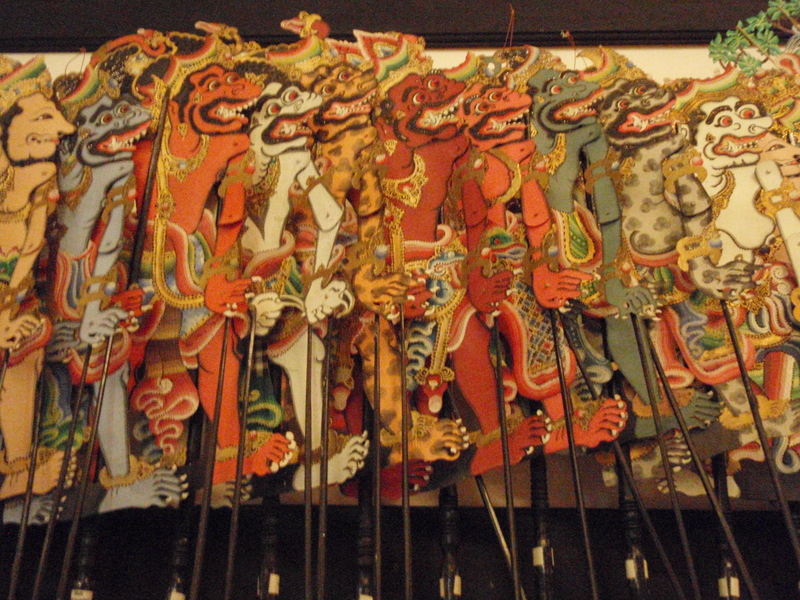 In Balinese wayang, four bronze instruments, called gender wayang, are used. 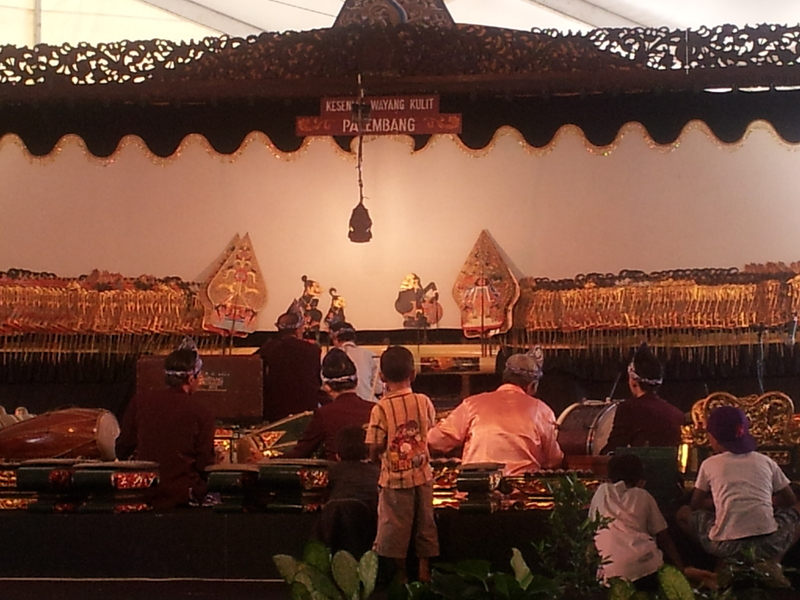 In Java and Sunda the set is a gamelan (gong chime). 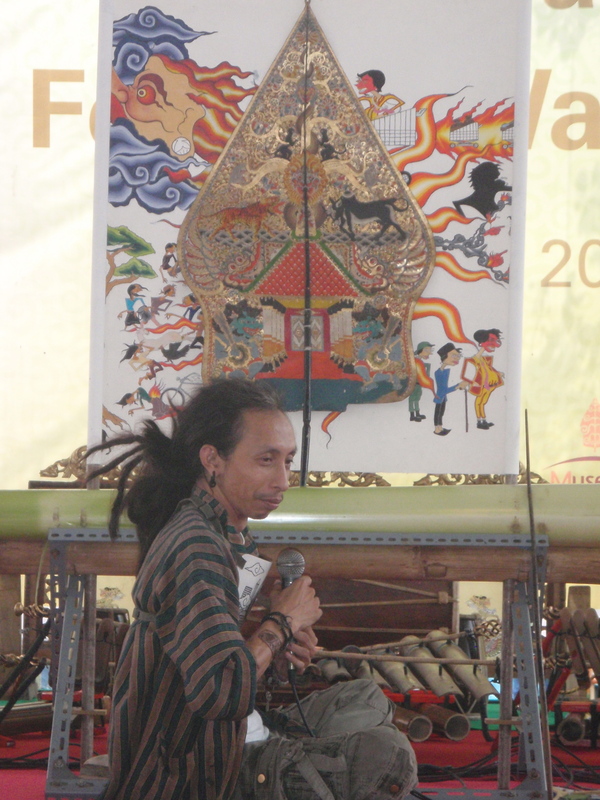 Instruments in Java usually include bronze metallophones with slab keys in different octaves: saron, peking, panerus barang, slenthem, gender; pot instruments: bonang, rincik, kenong, kempyang, ketuk; a xylophone: gambang; flute: suling; drum: kendang, ketipung, kulanter, bedug; hanging gongs: kempul, siyem, goong; and string instruments: rebab, celempung. 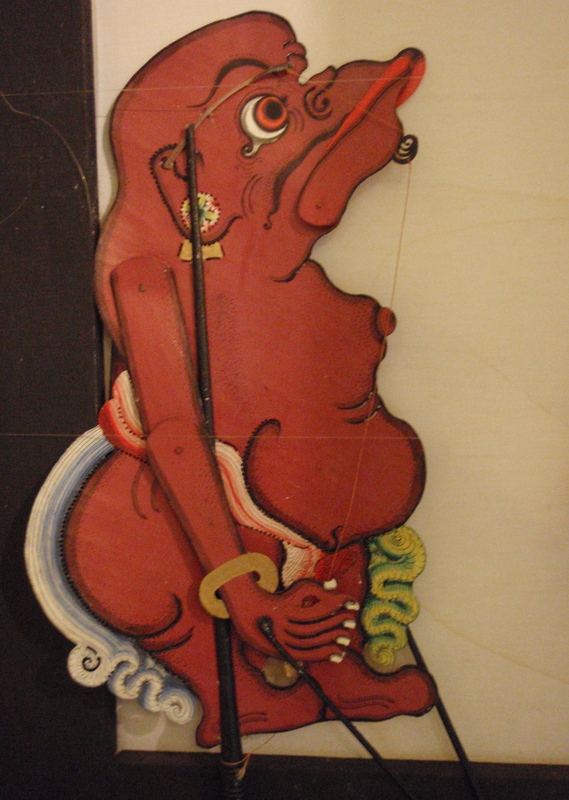 Voices, especially of the female singer (sindhen or pesinden), are also crucial. 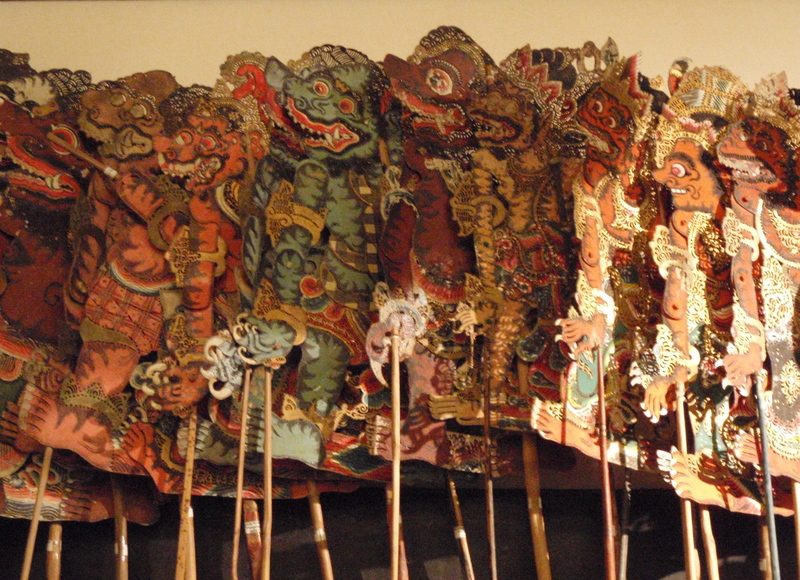 Central Javanese gamelan are today a combination of two sets of instruments, the more martial sounding five-toned slendro set and the pelog group, in which the intervals between the seven pitches are a minor key and felt to be melancholy and romantic. 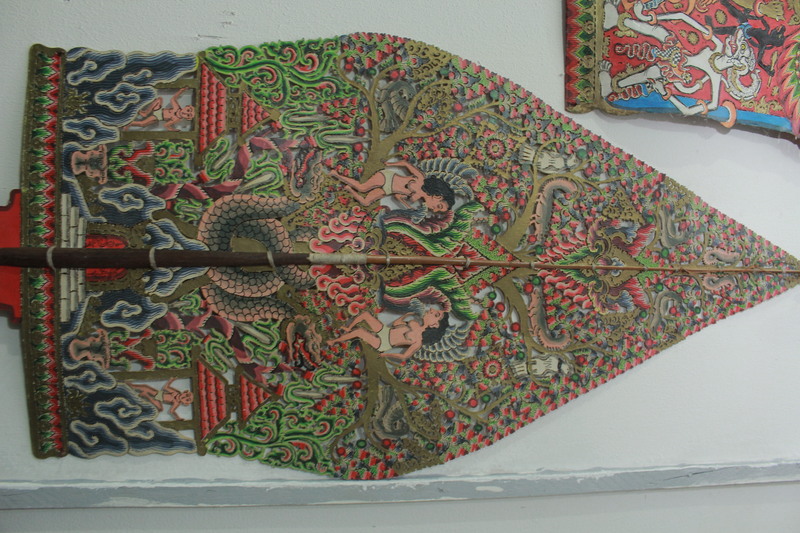 This combined pelog-slendro orchestra probably is a relatively recent innovation of Central Javanese courts, since in most of the regional forms the tuning is tied to the story cycle that is being presented. 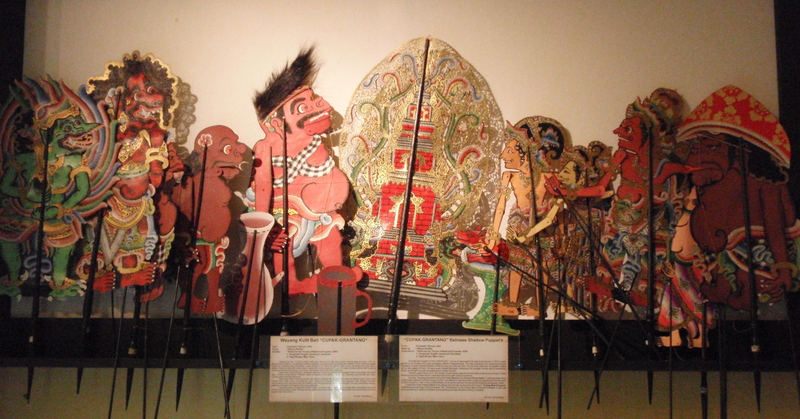 Slendro is used for Mahabharata and Ramayana stories while pelog is used for Javanese or Islamic legends. 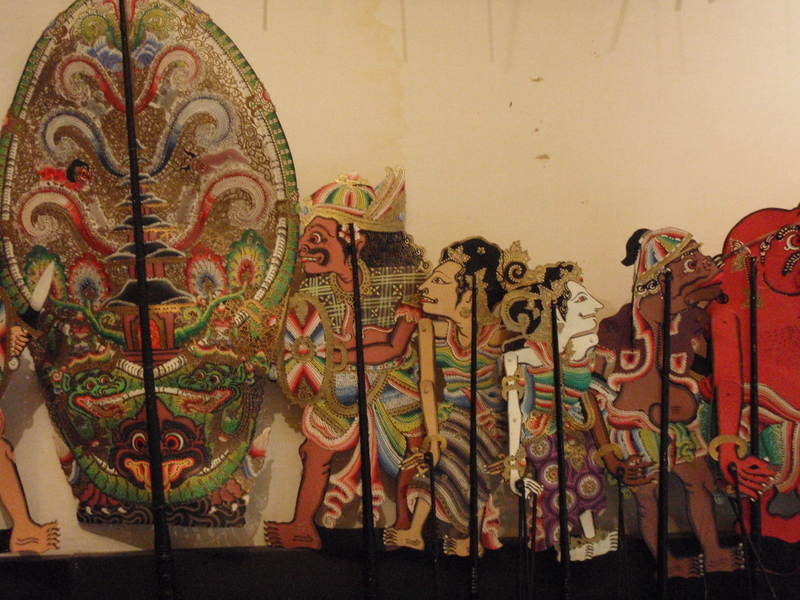 Music sets the scene of wayang in innumerable ways. The voices of the character types are related to particular pitches and rhythms of delivery. Certain tunes are associated with specific character types or actions. 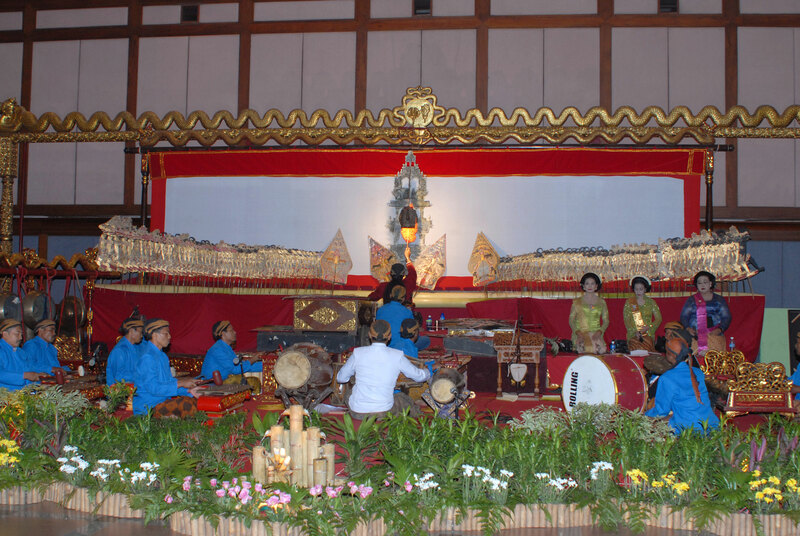 A final category of music is the mood songs (suluk), which set the stage musically. Thus, music defines the character, clarifies the action, and defines the emotional essence of the scene. Performers generate their text according to rules. 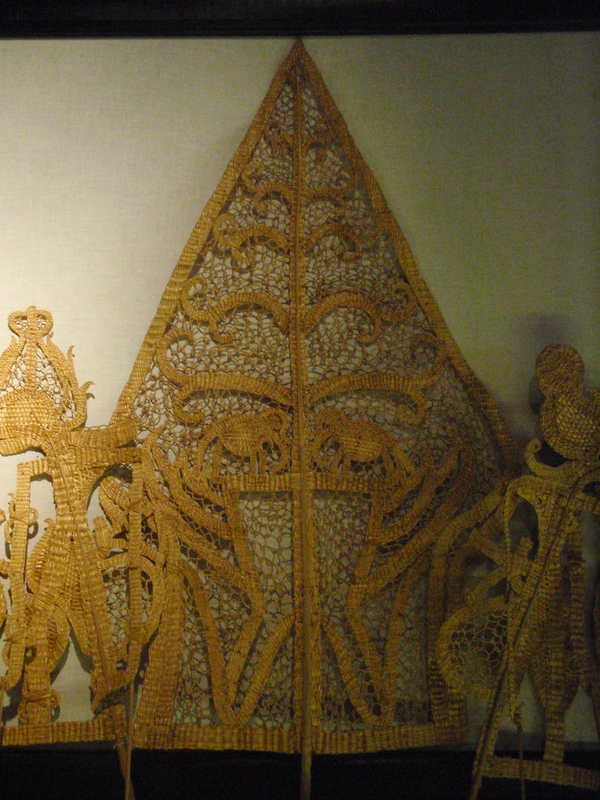 It is this structure that a would-be dalang studies. It begins with a long opening mantra, which the performer will use for virtually every story. One or more court audience scenes follow. In the middle of the performance comes an extended clown scene. A love scene is sure to be part of the mix, and everything will climax in one or more battles. 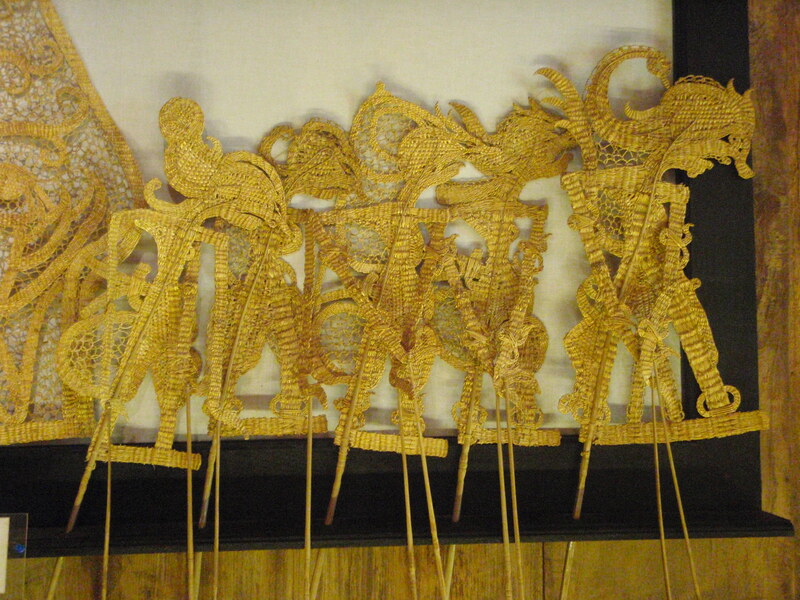 In the past, most learned wayang structure from assisting their dalang-guru. At the age of fifteen, a student might do his first presentations and fully establish himself as a performer by age twenty. 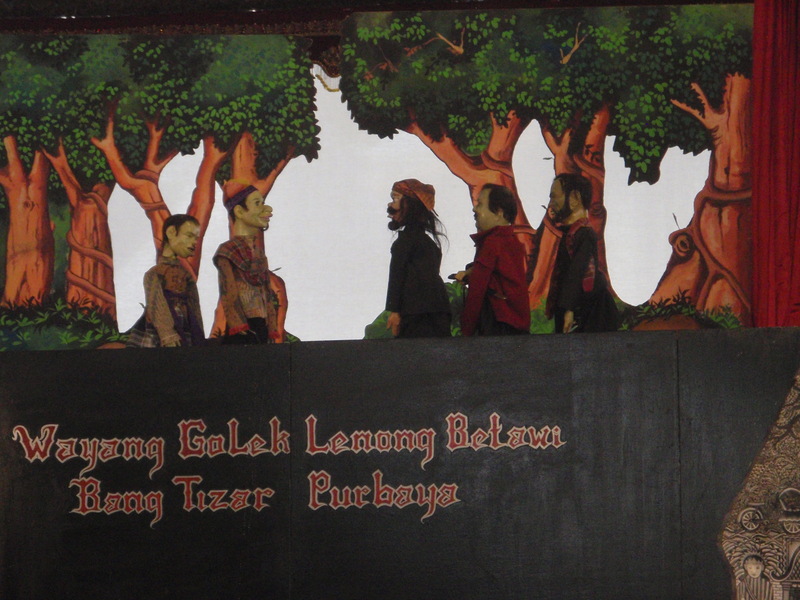 Oral learning is still the norm, but today many learn the art by studying it formally at tertiary institutions like ISI Surakarta (Institut Seni Indonesia Indonesian Institute of the Arts, Surakarta/Solo branch) in Central Java and ISI Denpasar (Institut Seni Indonesia, Denpasar branch) in Bali. 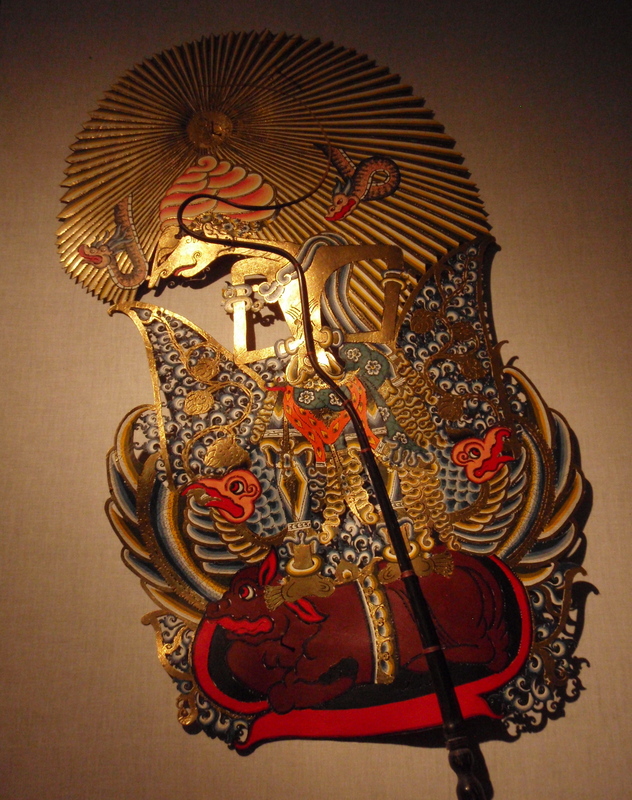 The performer memorizes passages in Kawi, the archaic and often linguistically corrupt language that will be inserted into certain types of scenes or introduce important characters. 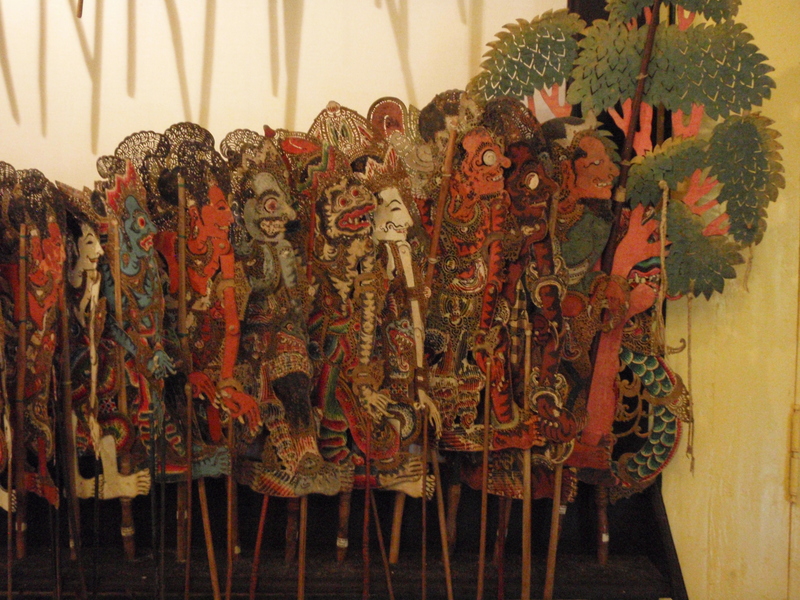 While usually neither dalang nor audiences fully understand these passages, they help make the world of wayang august and mysterious. 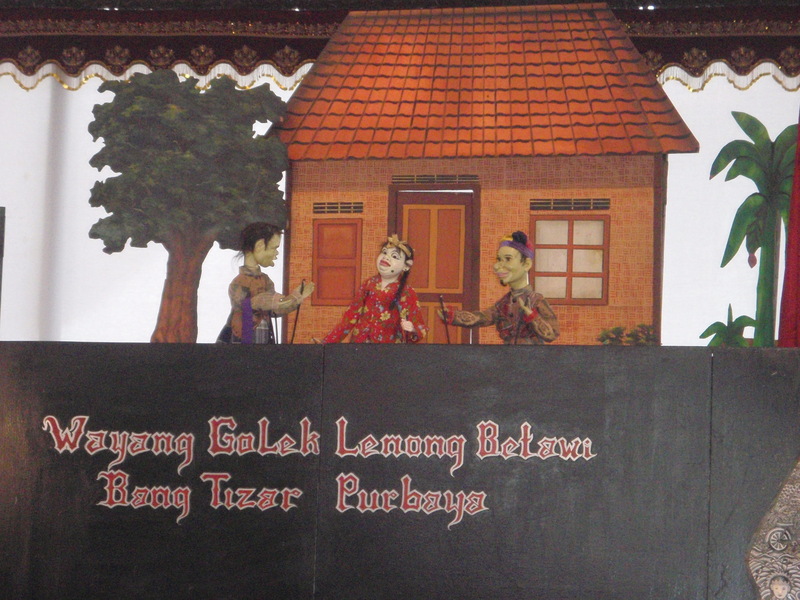 The dalang, by watching his teacher, accumulates a repertoire of phrases, songs, business that will be used in different stories. 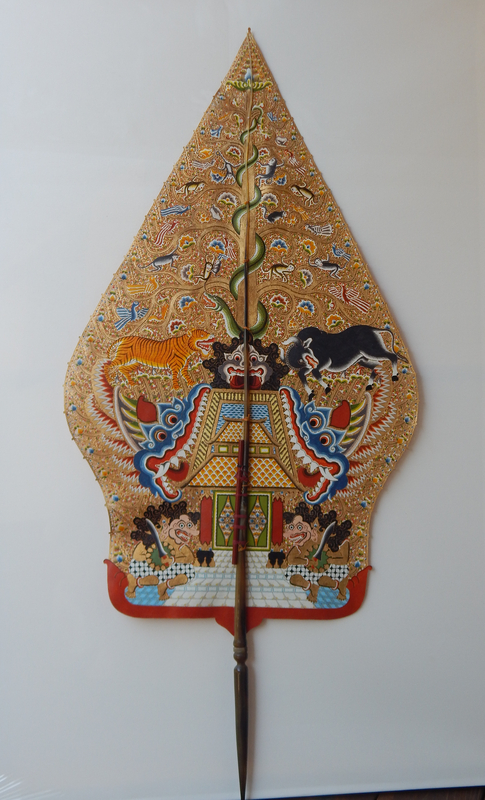 By memorizing the passages, knowing the structure that patterns a performance, and finally engaging his own creativity, the would-be dalang learns to generate performances effortlessly. 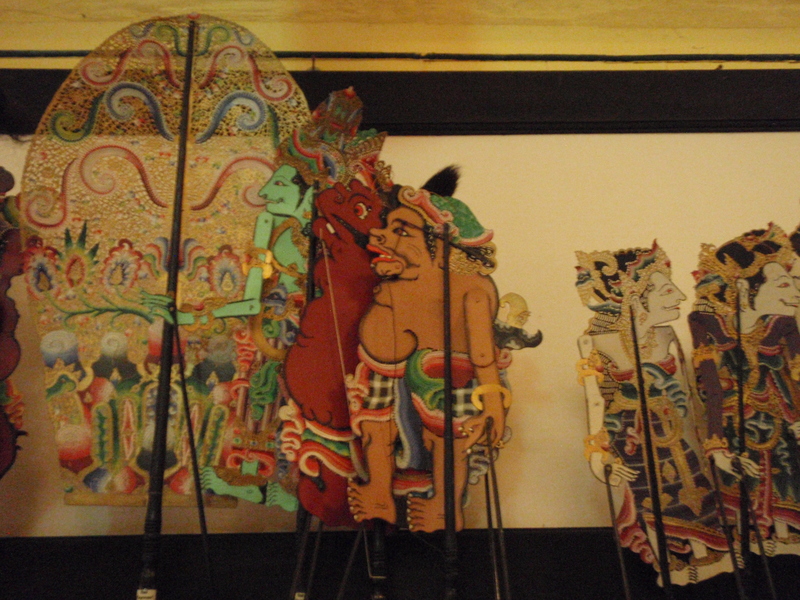 Much of the pleasure of watching wayang is to see how the skillful dalang negotiates the pre-defined structure. Scenes of clowning and the actions of ogres allow for the greatest deviation from traditionally set material. Gods and heroes are more tightly constrained. 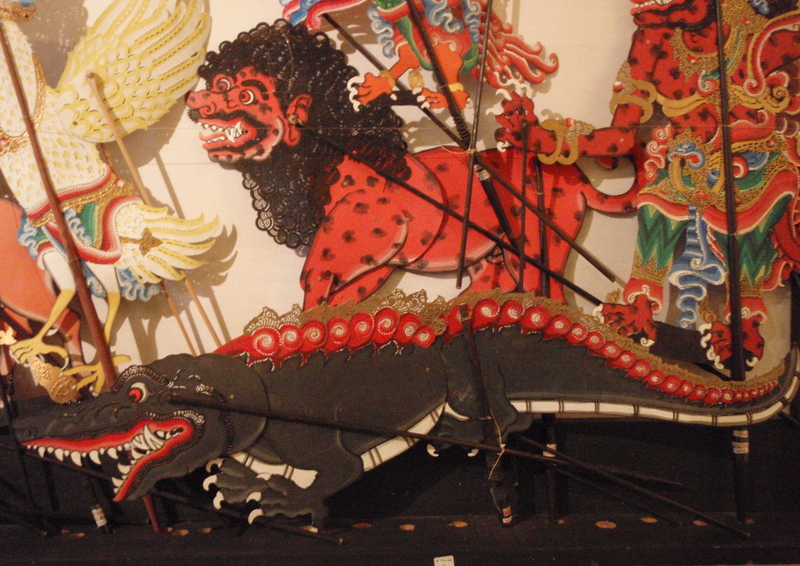 Narratives are of two types: pakem (“canon”) or galur (“ploughtrack”) is set, while karangan (“invented”) is newly minted. The pakem stories must be memorized and cannot change. 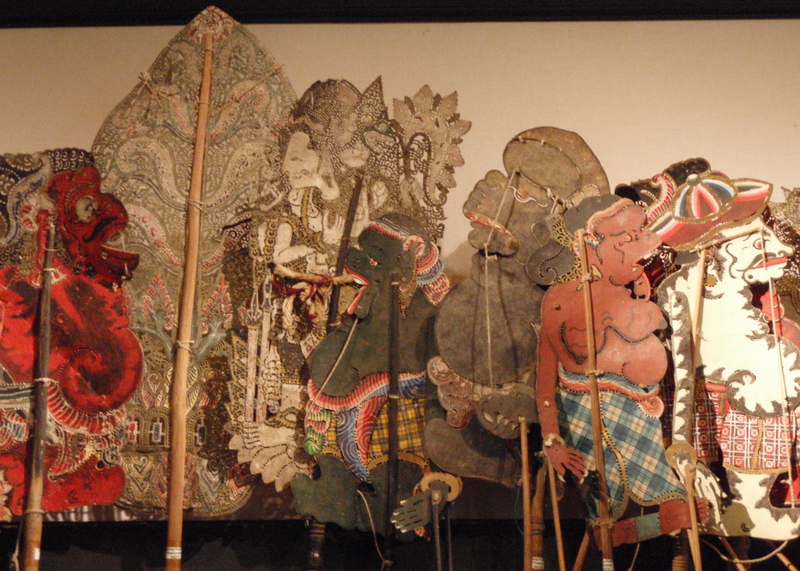 But the “karangan” characters and situations can be interpolated into as long as they fit the set material. 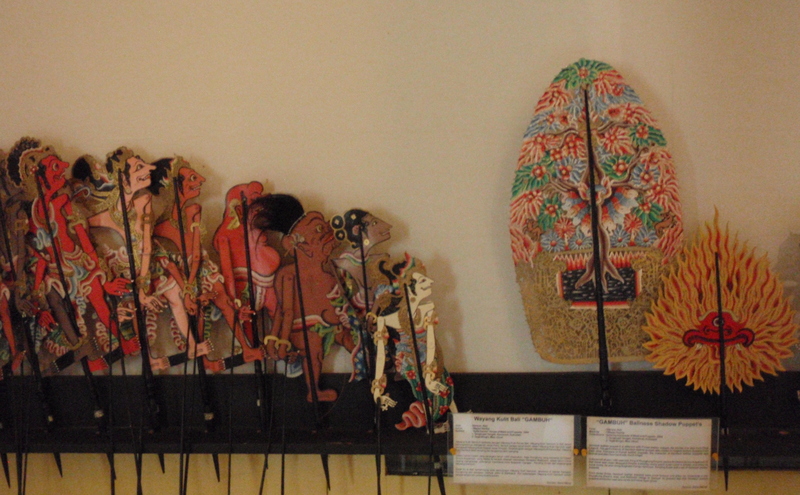 Potentially there are hundreds of kinds of wayang. There are a few simple rules that help one sort out what the form is likely to entail. 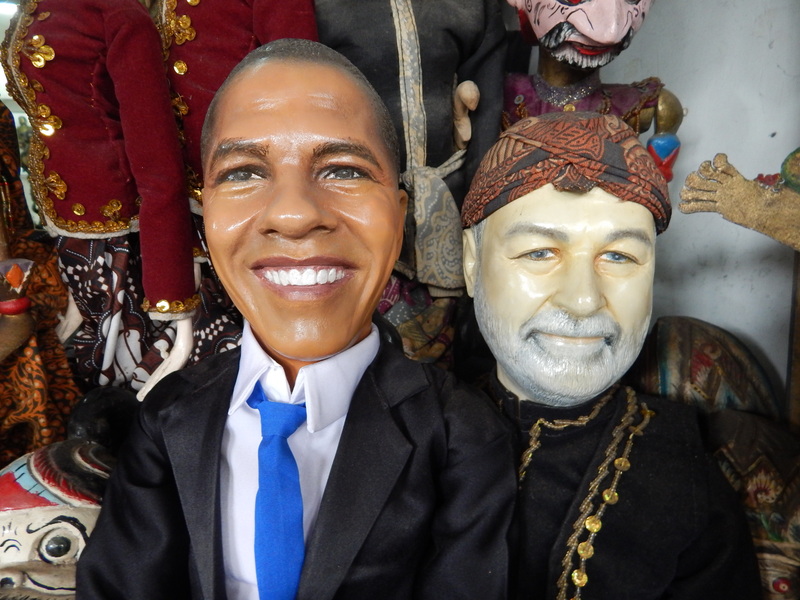 In Indonesian theatre the first term in a name is likely to refer to the genre. 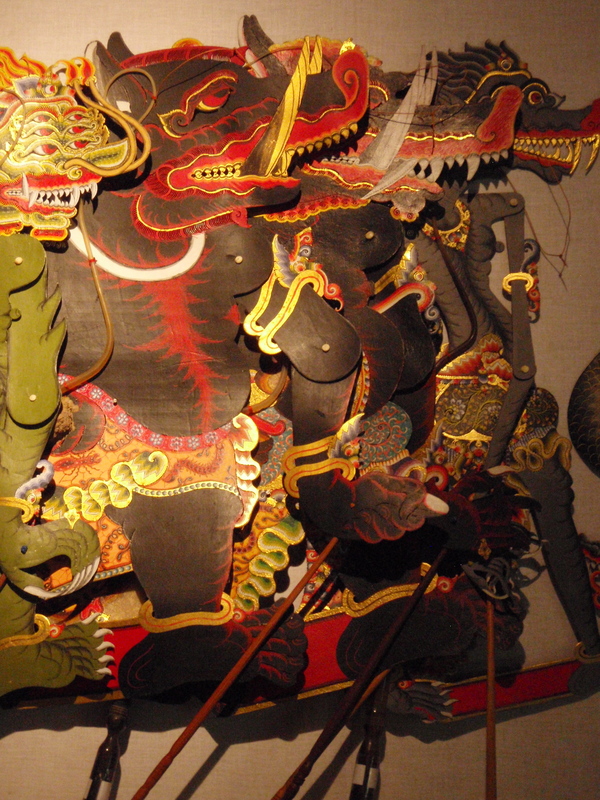 Here wayang is the genre and means a performance which is narrated by a dalang, accompanied by a gamelan, and using types and structured improvisation. The second term will usually be the medium in which the performance is presented. 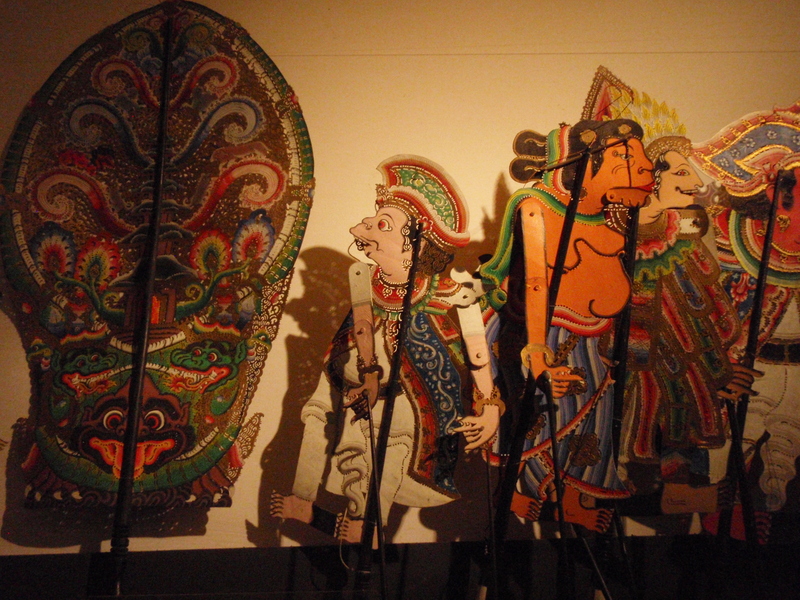 This may be painted story scrolls (beber), leather shadow puppets (kulit), flat wooden puppets (klitik), wooden rod puppets (golek), masks (topeng) or an unmasked dancer (wong or orang). 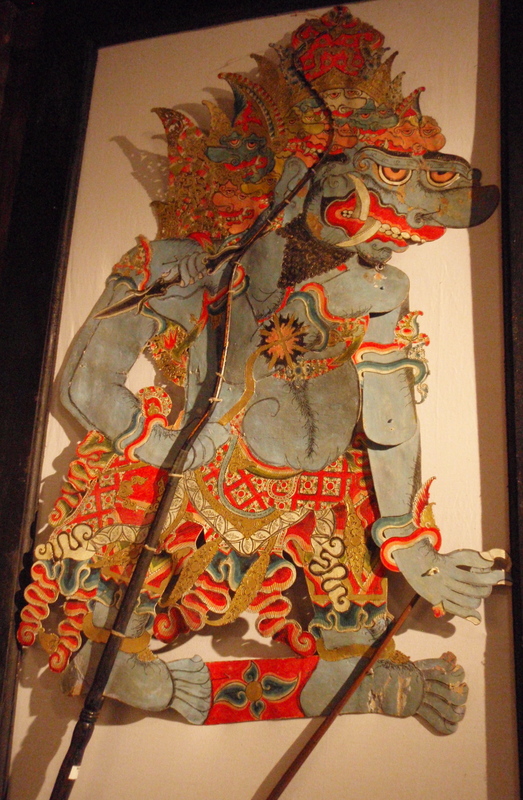 Rama incarnates and saves his wife Sita from the demon Rahwana, or Arjuna Sasrabahu (or Sastrabahu), an incarnation of Wisnu (Vishnu) who saves his wife Citrawati from Rahwana. If the term is menak, “aristocrat”, the tale deals with the exploits of Amir Hamzah an uncle of the Prophet Mohammed and the perfect Islamic king. 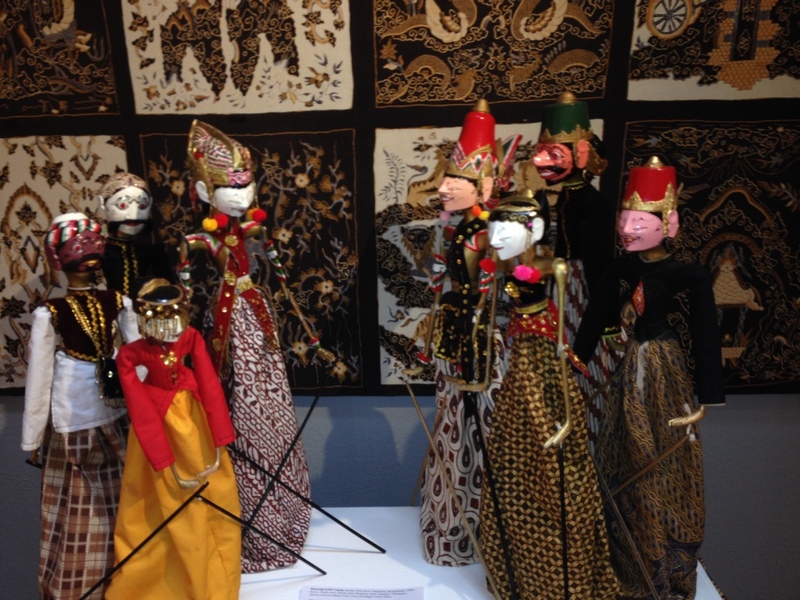 Cepak means in Javanese-style dress, so these stories will tell histories and legends of the Javanese kings such as the amorous Prince Panji – gedog is another term applied to Panji stories – or Damar Wulan, a stable boy who saves Queen Kencana Wunggu from the aggressive Menak Jingga is also part of wayang cepak. Babad are historical chronicles. 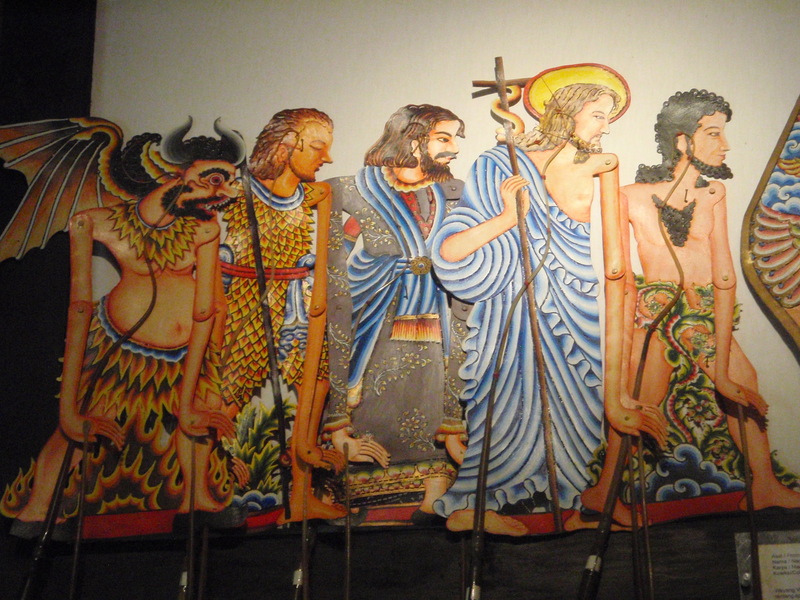 Wahyu (“power”) are Christian Bible stories. 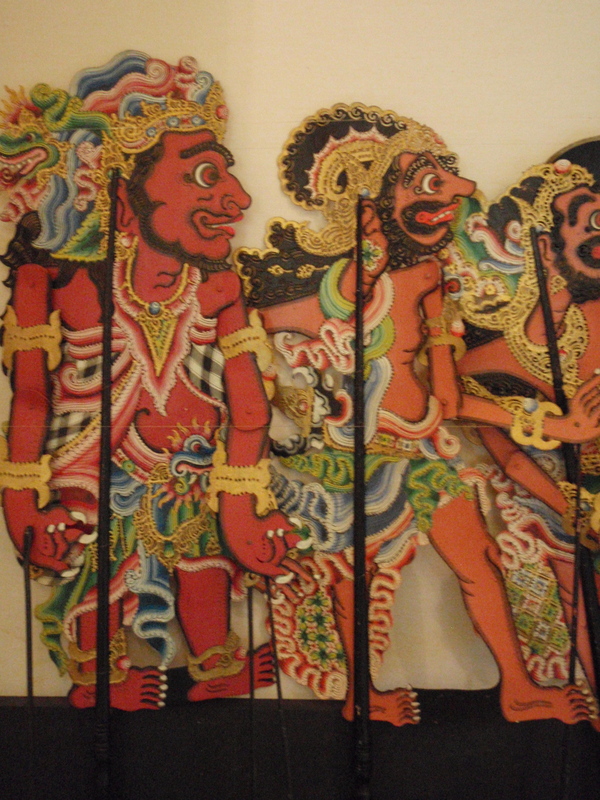 Madya (“middle”) are tales of East Javanese kings. 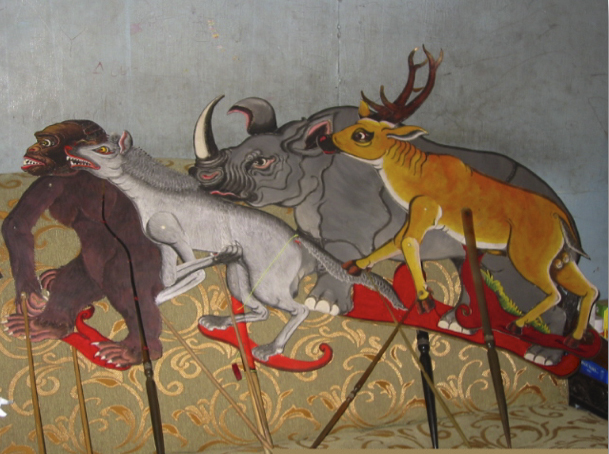 Kancil (or kantjil) are stories of a mischievous mouse-deer. 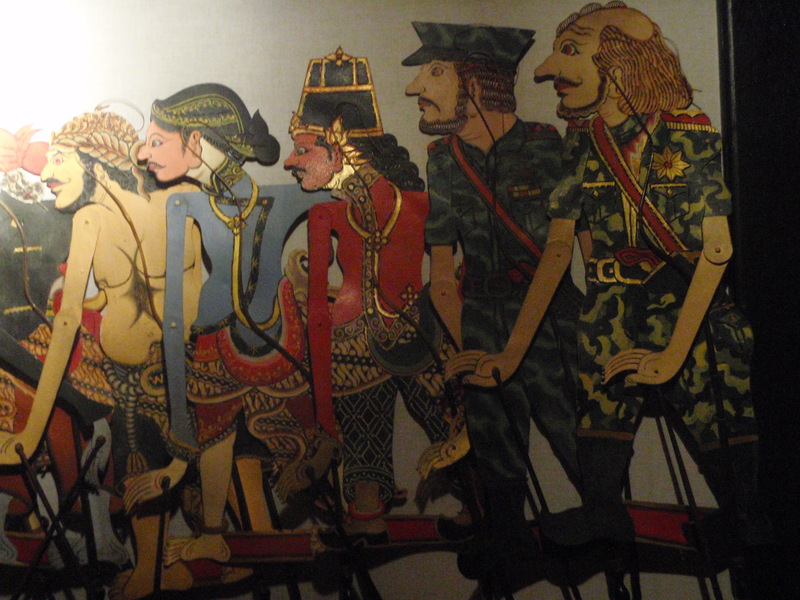 Suluh are history stories of the 1945 revolutionary heroes like Sukarno (Soekarno) and Hatta, and so on. 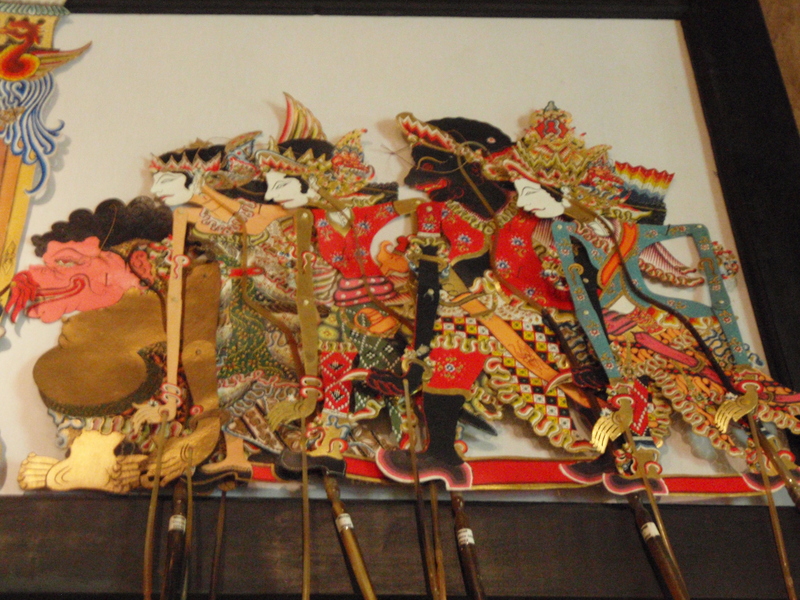 Dalang frequently are credited with developing a new style of wayang: most often they will do this by introducing a new story. 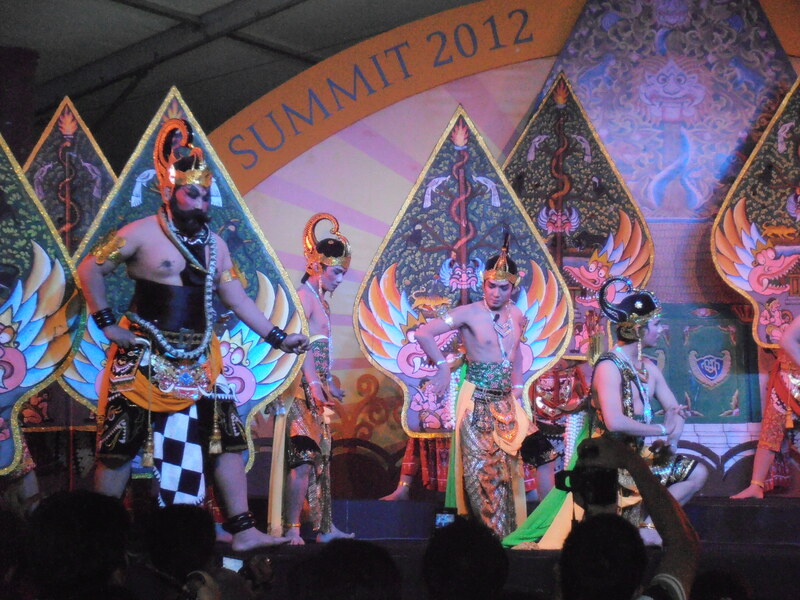 The final term in the name may indicate the language/culture area of the performance: Bali, Jawa (Java), Sunda, or sometimes the city of the form’s birth. 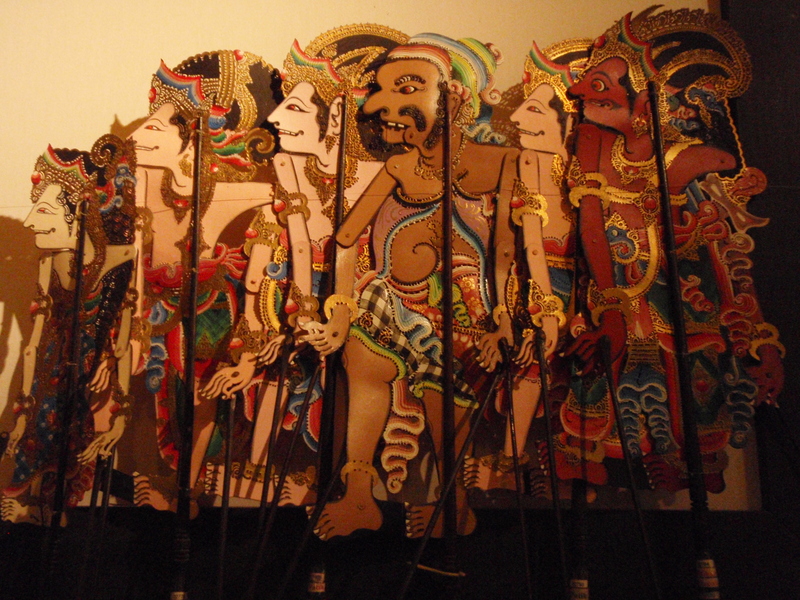 Thus, wayang kulit purwa jawa we can expect to mean 1) a semi improvised performance by a dalang, 2) using figures made of leather (kulit), 3) telling Indian epics (purwa), and 4) in Javanese language and style. 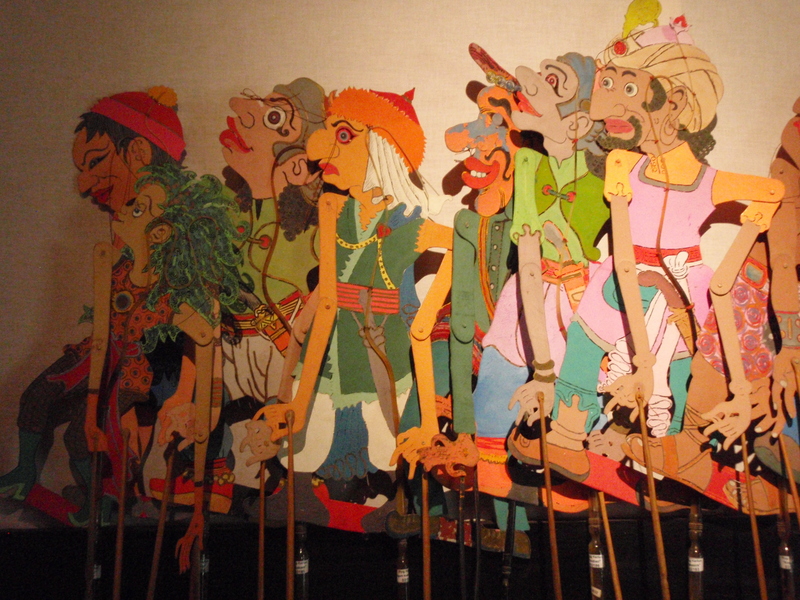 Wayang golek purwa sunda will be wayang using three dimensional rod puppets (golek) telling Indian epic stories (purwa) in Sundanese language and style. 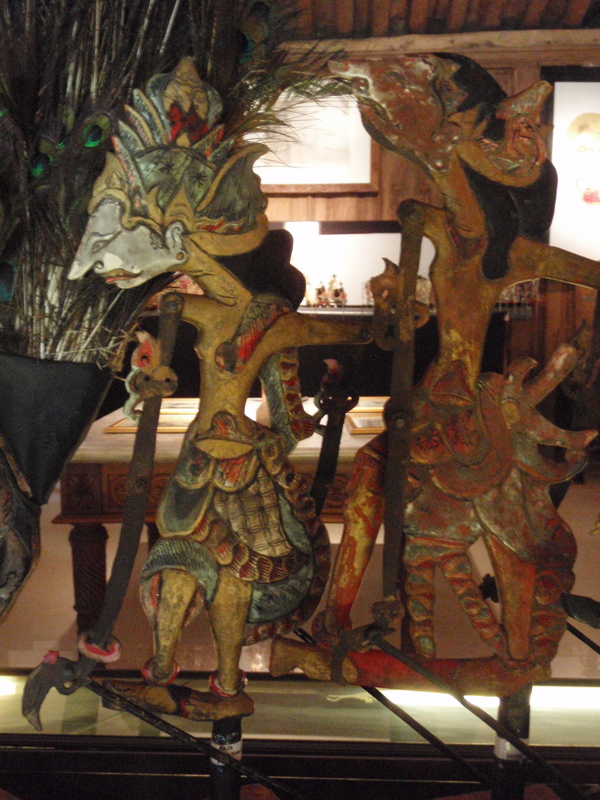 Wayang topeng purwa would utilize masks (topeng) to tell Indian epic stories (purwa). 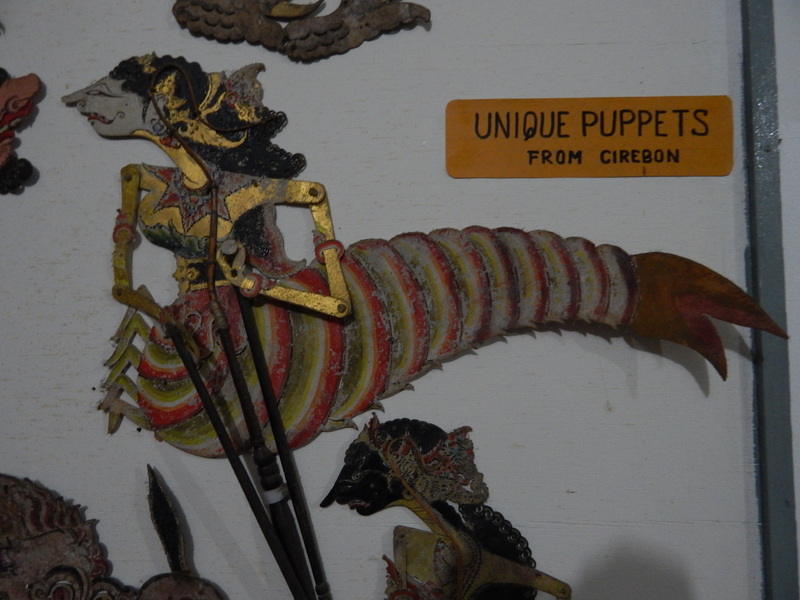 Many story cycles or performance media can be presented in the pan-Malay genre of wayang, but in each major language area one style of wayang is the norm and provides a model for inventing newer genres. 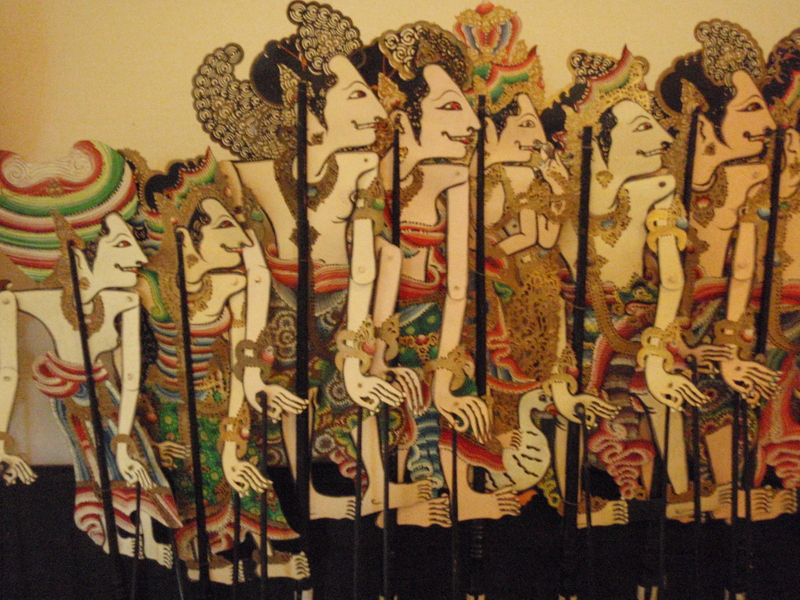 The most important style of wayang on the island of Bali is wayang (kulit) parwa bali. 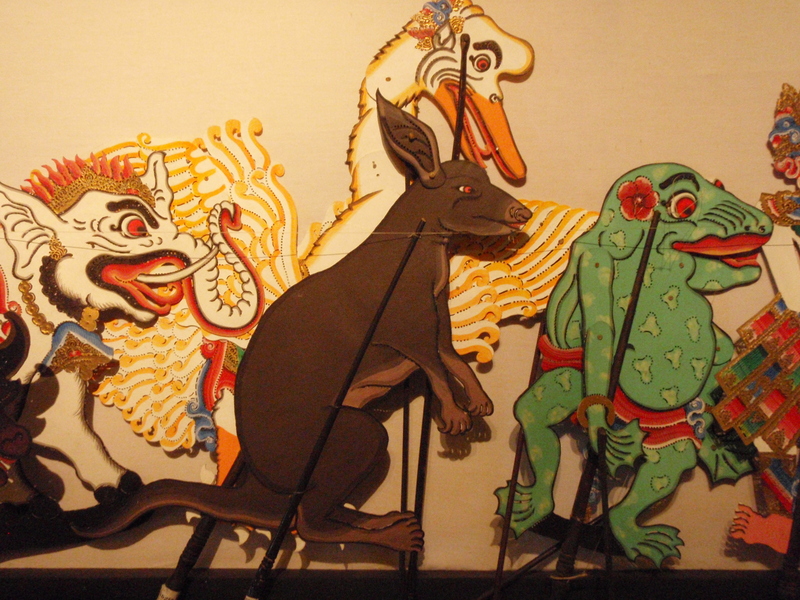 On a screen 2 metres x 1 metre, the puppeteer presents a shadow play with flat leather puppets about 30-50 centimetres that have a central rod plus rods attached to each hand. 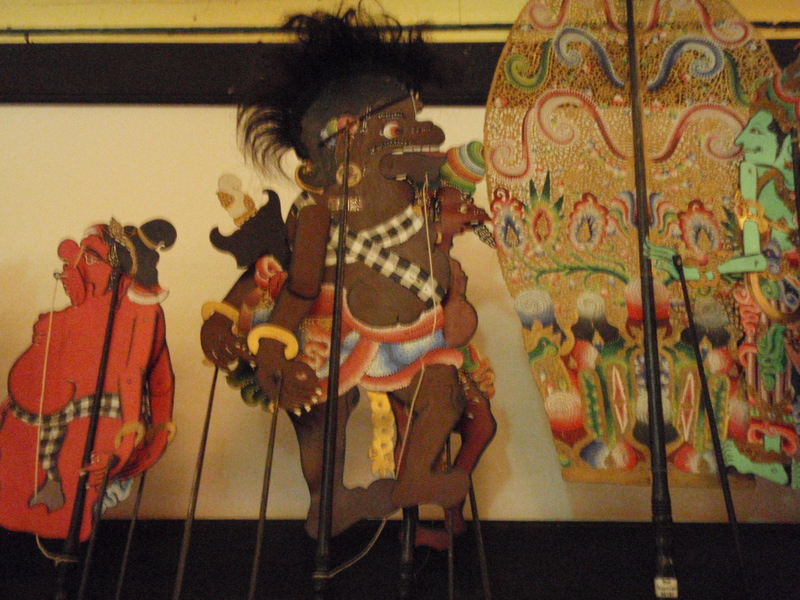 The dalang sits behind the screen with the horizontal stalk of a banana tree as his playing board where he plants the central rod of the puppets. 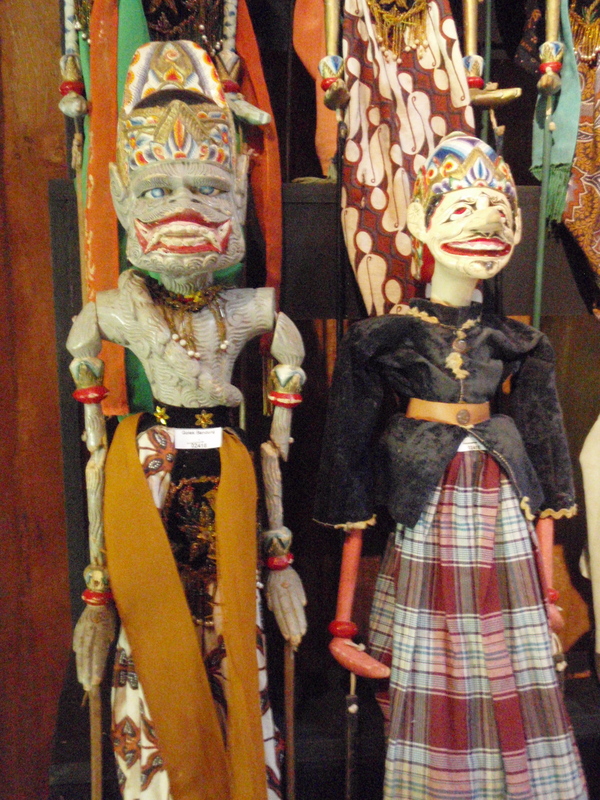 Noble characters speak in Kawi, archaic Javanese, while the clown servants translate into contemporary Balinese. Since clowns serve as the interpreters of all the events there is ample room for the “little guy’s” take on the story: when the evil Kurawa burn down the Palace of Lacquer where the Pandawa brothers are housed, the clown might interpolate comments about the 2002 Bali bombings where the local Hindus were targeted by Islamic terrorists from Java. Clowns link epic and present time through their translation function. 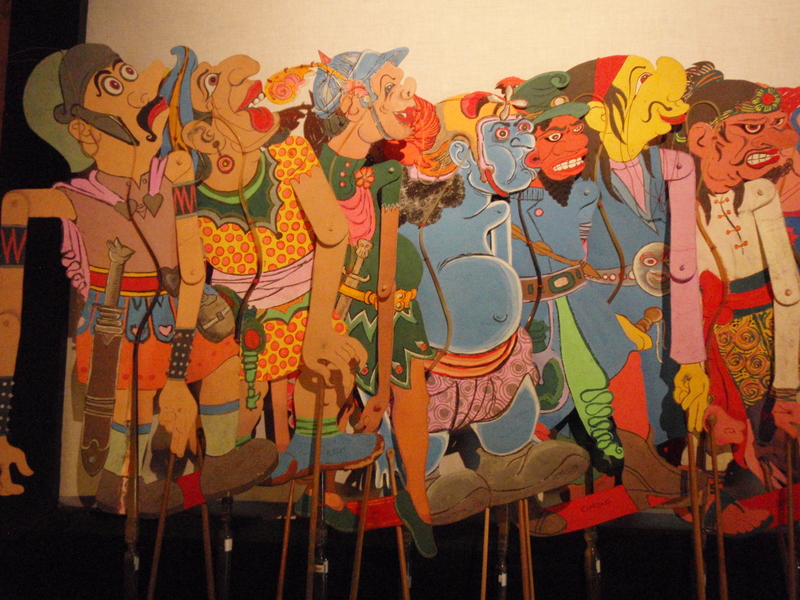 Mahabharata stories are the norm, but other tales may be presented. 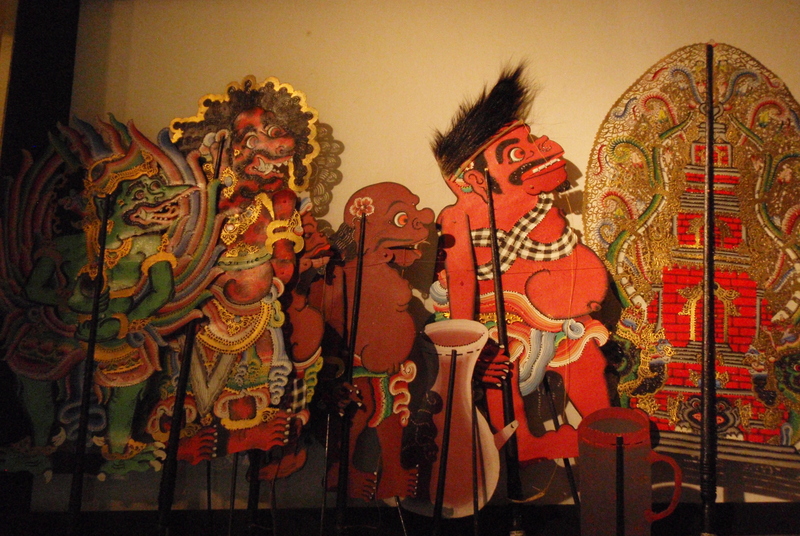 For Ramayana stories, drums and other percussion instruments are added to the gender orchestra to make the many battles lively. 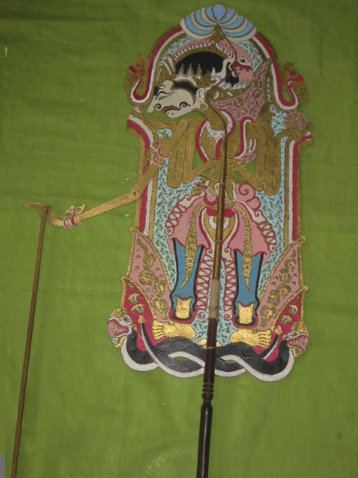 Wayang (kulit) arja was invented by Dalang Sidja in the l970s. 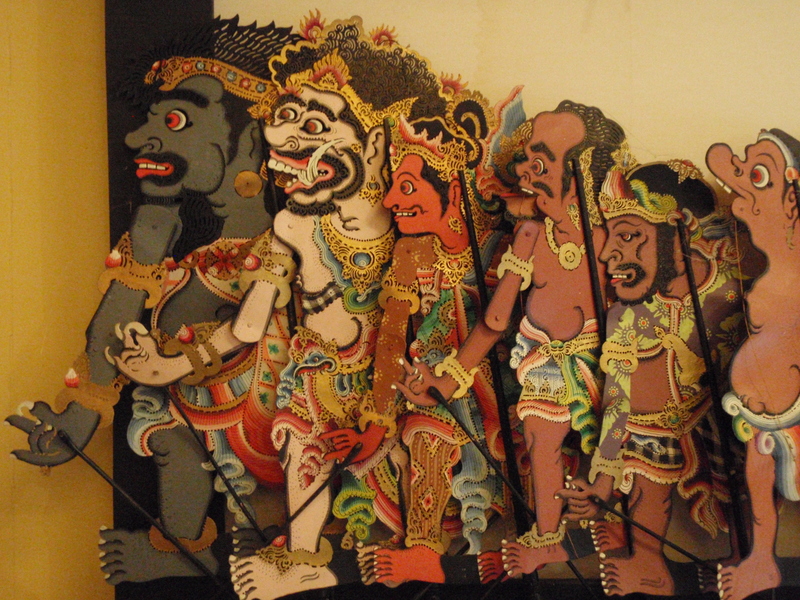 It uses shadow puppets to tell stories of Panji. 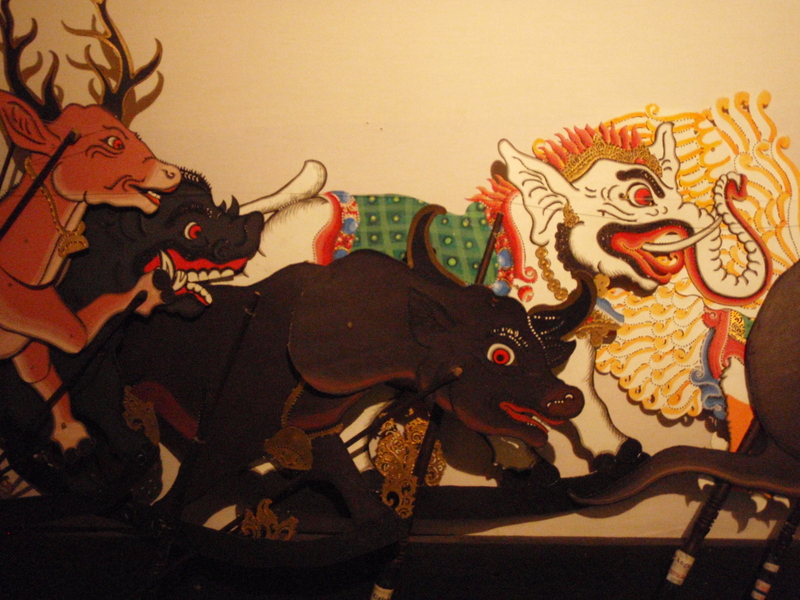 Wayang (kulit) Tantri, innovated by I Wayan Wija in the l980s, uses leather shadow puppets to tell Hindu animal stories. 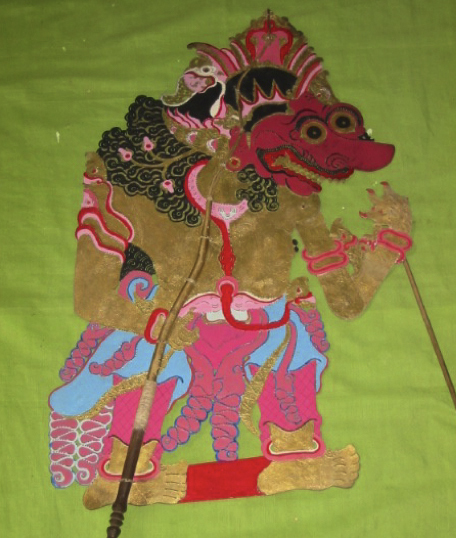 Wayang kontemporar (“contemporary wayang”) is a genre of the present found at ISI Denpasar (Institut Seni Indonesia, Indonesian Institute of the Arts, Denpasar campus), the tertiary arts training school in Bali. 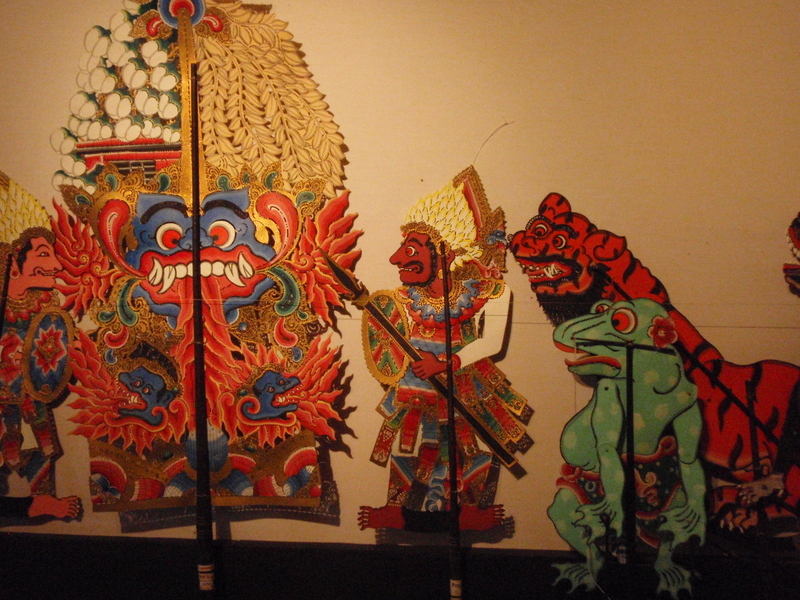 Wayang kontemporar has grown from younger puppeteers collaborating with Western shadow theatre artists. 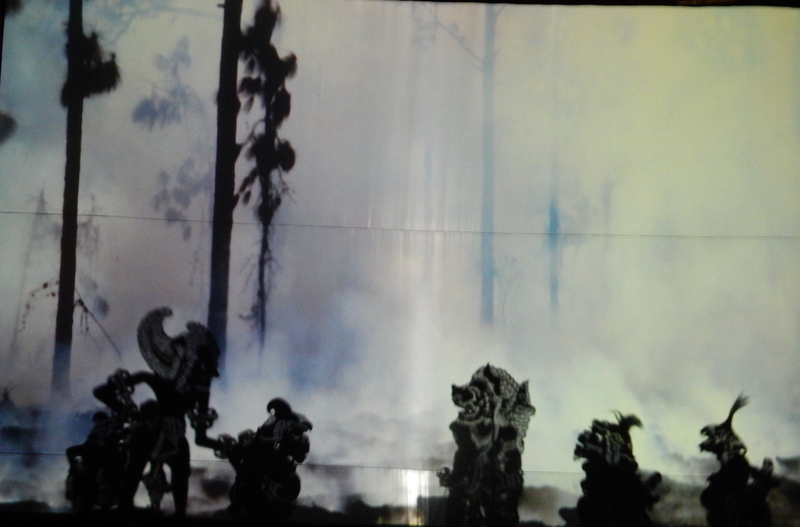 It uses a 7 metre x 3 metre screen and combines puppets and shadow dancers who wear headdresses and masks. 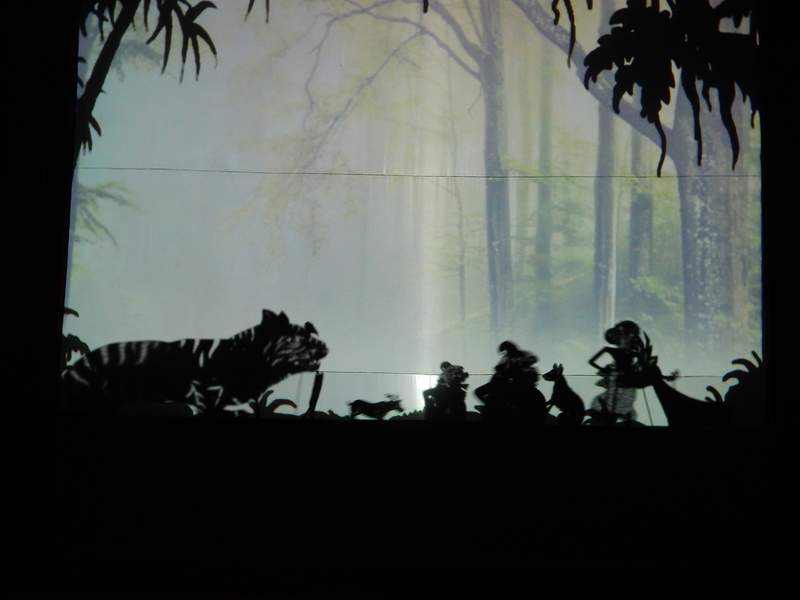 Power Point projectors and images provide light and scenery, and synthesizers combine with gamelan music. 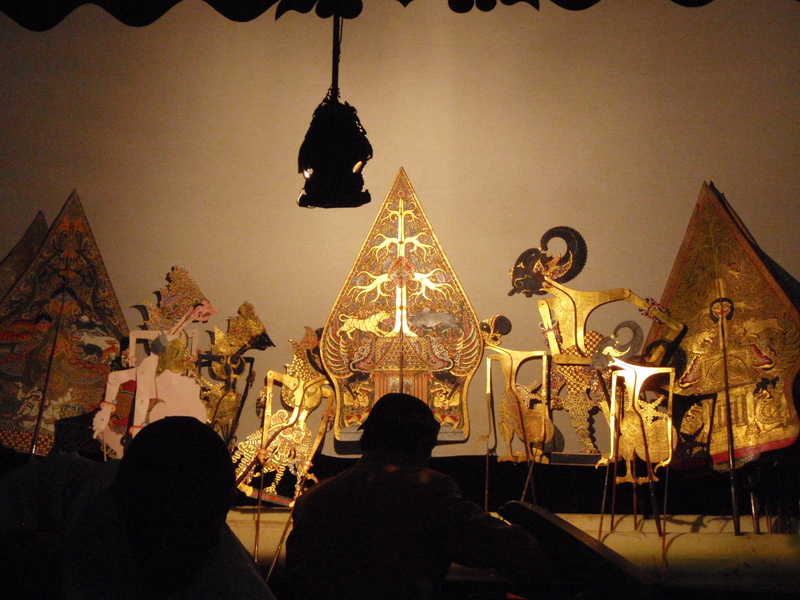 Wayang kulit purwa jawa, with thousands of trained dalang, is the refined shadow play of Central Java developed under the influence of the court cities of Surakarta and Yogyakarta. 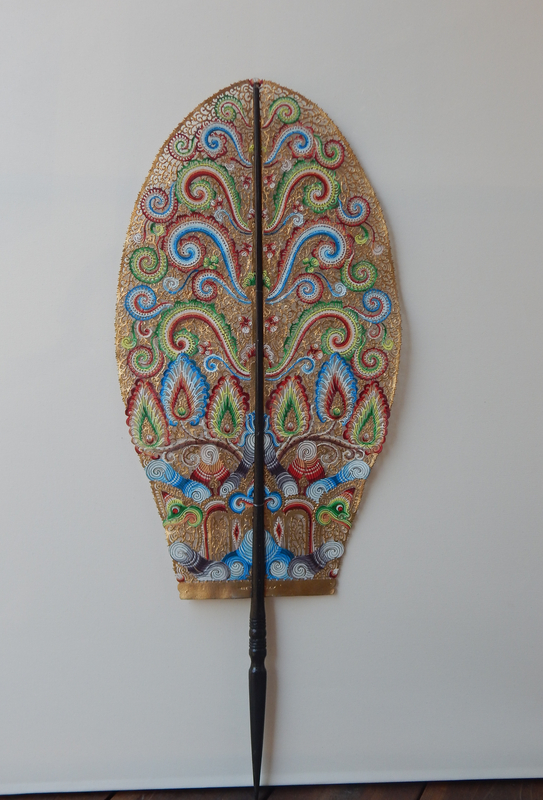 It is presented on a screen 4 metres x 1.5 metres with a large gamelan orchestra which includes two different tuning systems. Traditionally, songs will be played in three different pathet (musical and affective mode) in the course of the evening. Tunes will start on one note in the early hours, another one starting about midnight, and another note as the night draws to an end. The changing pitch helps reinforce the rising tension of the narrative structure. 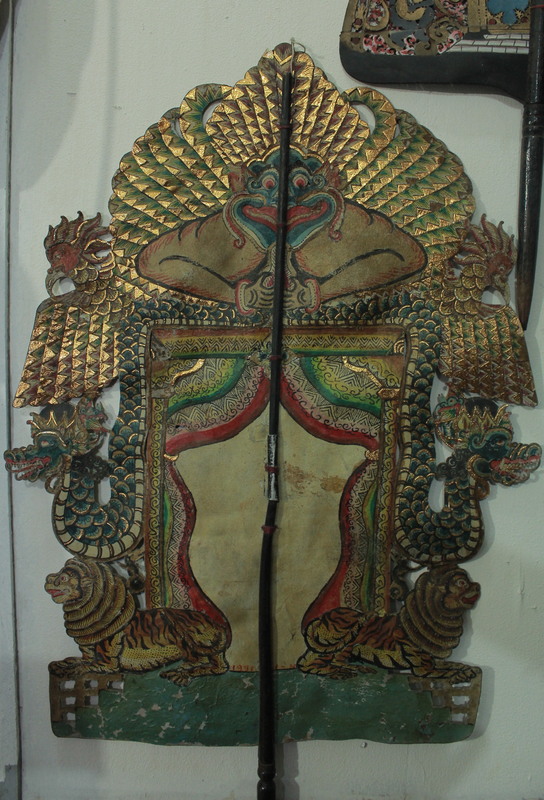 A kotak (puppet box) includes hundreds of intricately carved puppets, painted or covered in gold leaf. 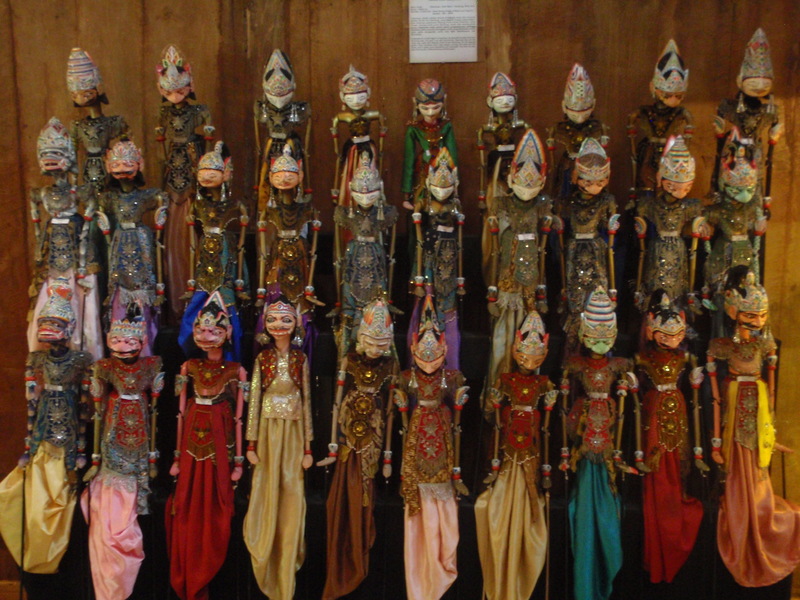 Fifty or more figures may appear in a single performance. 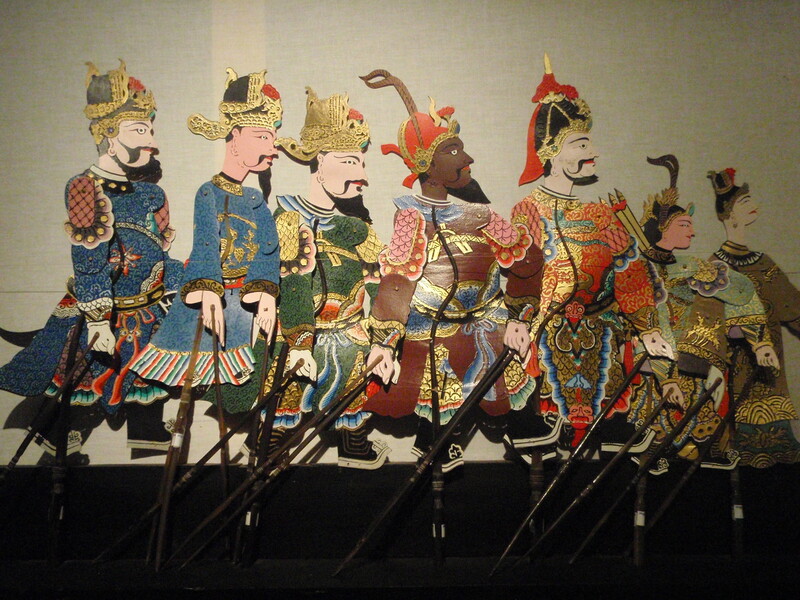 Figures range from 20-50 centimetres in height, and up to sixty may appear in a single show. Electricity has replaced the oil lamp (blencong) of the past as a light source. Performances are presented outdoors, either in a permanent pavilion (pendapa) or one which is built for the occasion by the host who hires the performance. 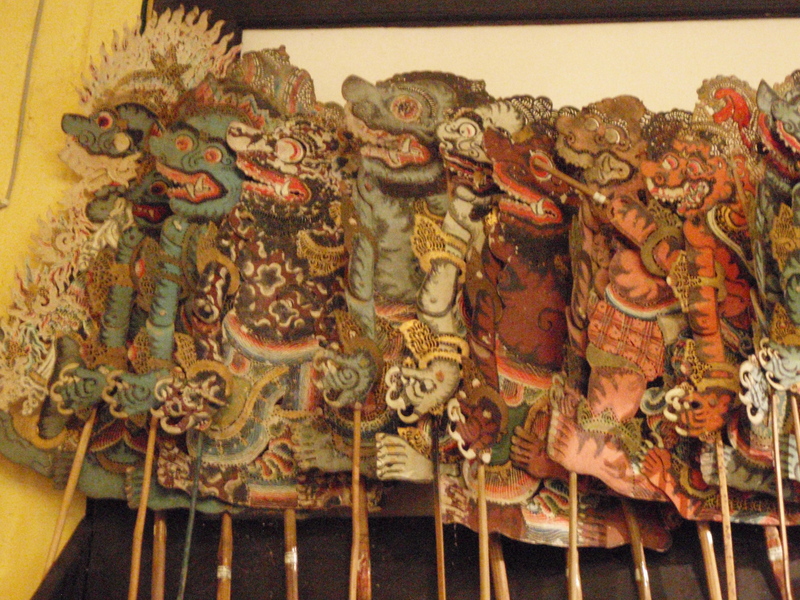 Wayang performances traditionally were presented from 9 p.m. till dawn. 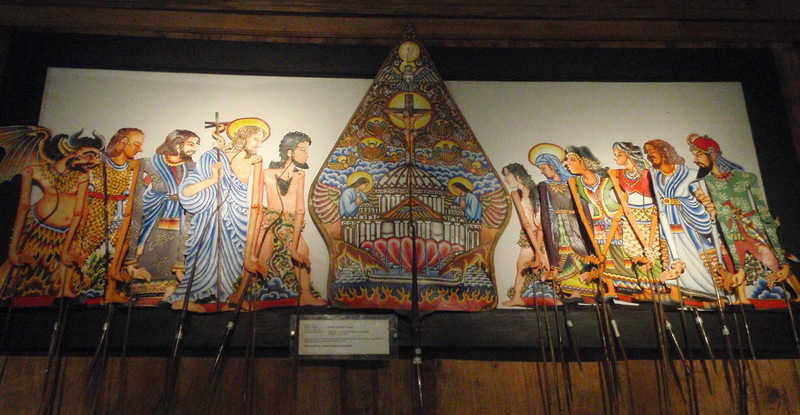 Today, performances are shorter, except for the ritual exorcism of the demon Kala – the ruwatan (“make safe”). Other presentations will end before the morning Islamic call to prayer. 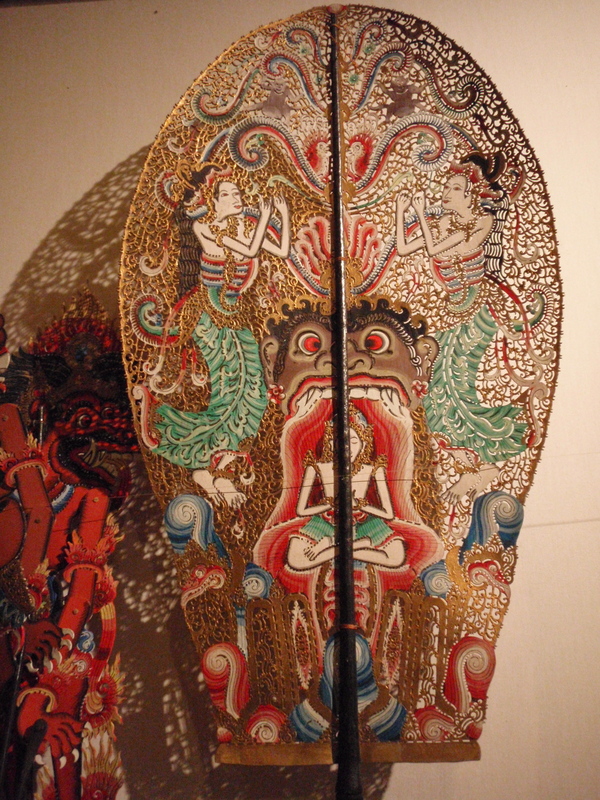 Invited guests are seated on chairs and watch the dalang side of the screen, uninvited watchers may view either shadows or puppets and stand or sit wherever space allows. Audience members come and go during the evening, watching when they like or eating, visiting, and enjoying the carnival atmosphere of the event. 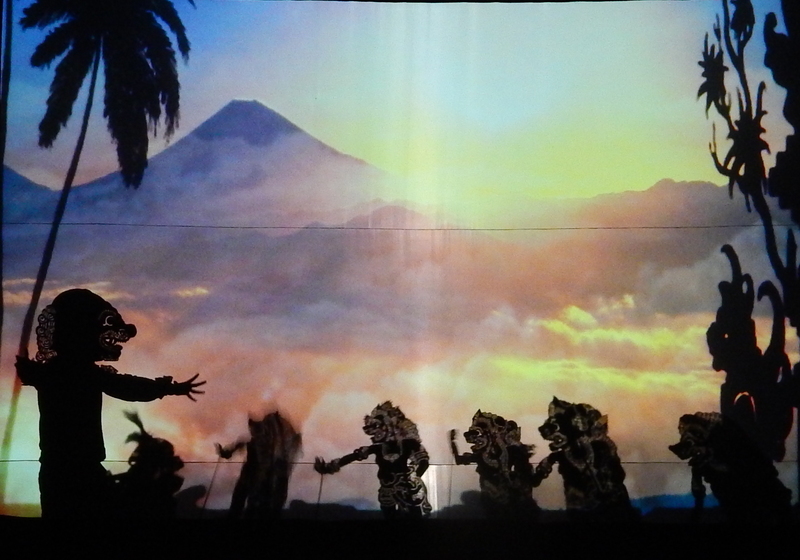 The dalang‘s narration between scenes makes the narrative accessible to viewers who have missed parts of the performance. 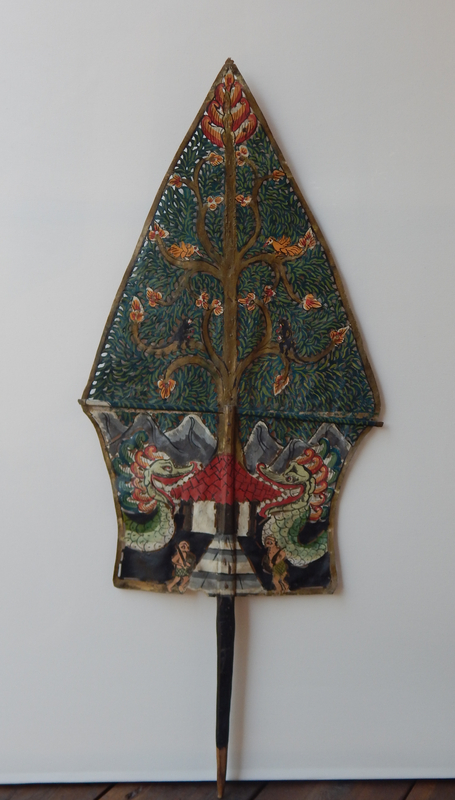 The classical Javanese structure begins with the dance of the tree of life (kayonan or gunungan; the latter also the “holy mountain” incorporating the tree of lfe). The janturan, a long passage with many Sanskritized words, opens the evening. The first scene is set in a court; next, the king may admire the gate of his palace and greet his wives. In the outer courtyard the king’s soldiers prepare for a mission and leave. They clear the road. A second court scene with the exit of troops is sometimes followed by yet a third court scene and that group’s departure. Next, the groups will meet in an inconclusive battle. 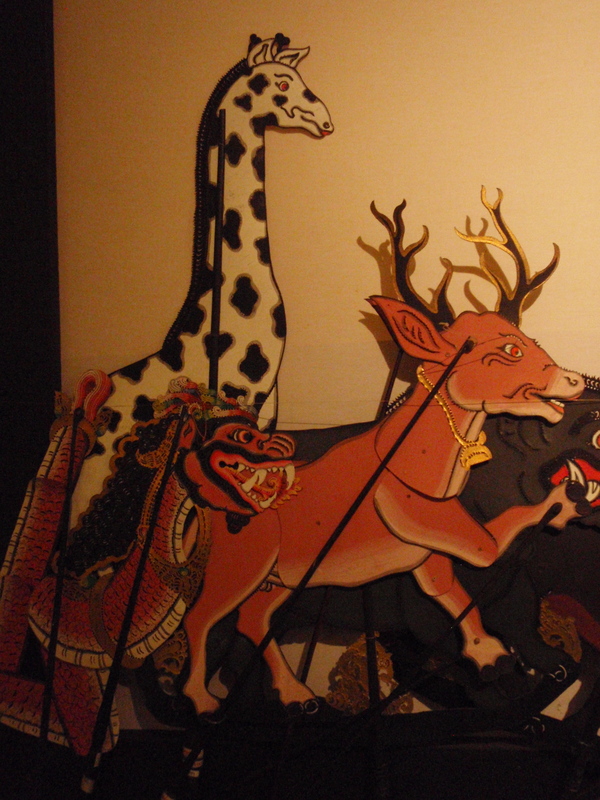 Around midnight, the second part of the story begins with a clown scene (goro-goro). Much singing and joking occurs before the hero meets with the clowns and his teacher who imparts philosophical ideas. The young man leaves the teacher. 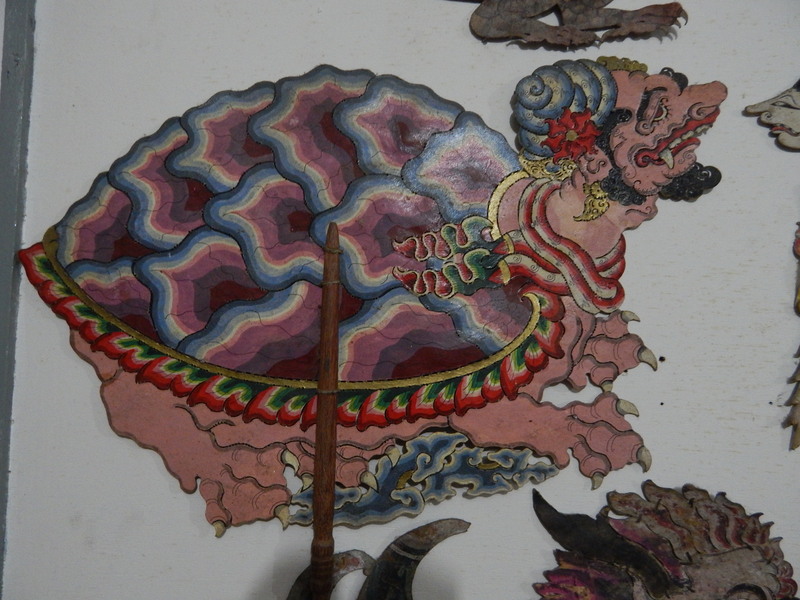 He descends the mountain and encounters ogres that represent greed, anger, and other human failings in the flower battle (perang kembang). By slaying these demons the prince shows he is ready to engage in the demands of life, and, from this point, is involved in the actual crisis of the evening’s narrative – saving a kidnapped princess or finding a magic power. 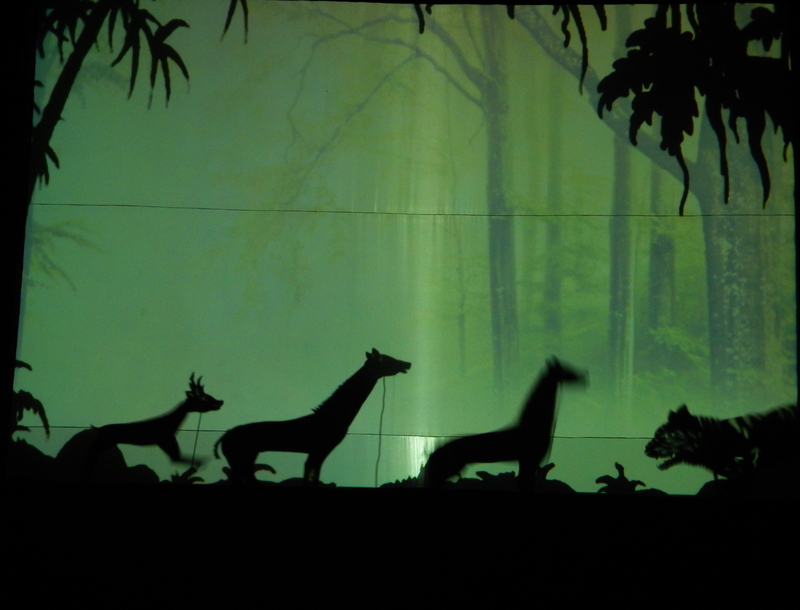 The scenes appropriate to the particular narrative take up the third part of the night and build to the final battle where the antagonist is dispatched, when the tree of life is planted in the centre of the screen signifying the end of the show. Most performances are primarily an entertainment that is hired by families for weddings or circumcisions. Performances may also be staged for political rallies or Independence Day celebrations. Stories are usually based on the Mahabharata but rather than focus on the climactic battle between the Pandawa heroes and their Kurawa opponents, most performances will show the heroes in a less traumatic part of life when the heroes are coming of age and the grudges only developing. 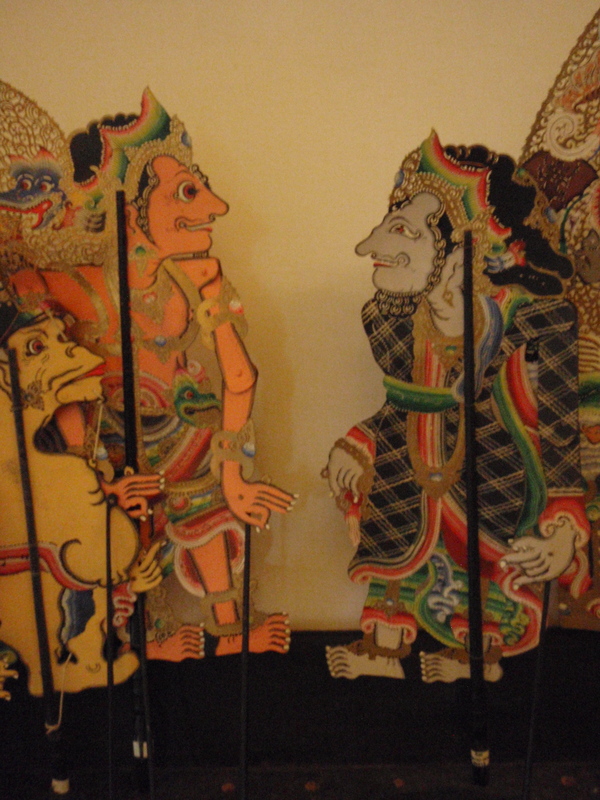 Javanese dalang identify three types of wayang story. 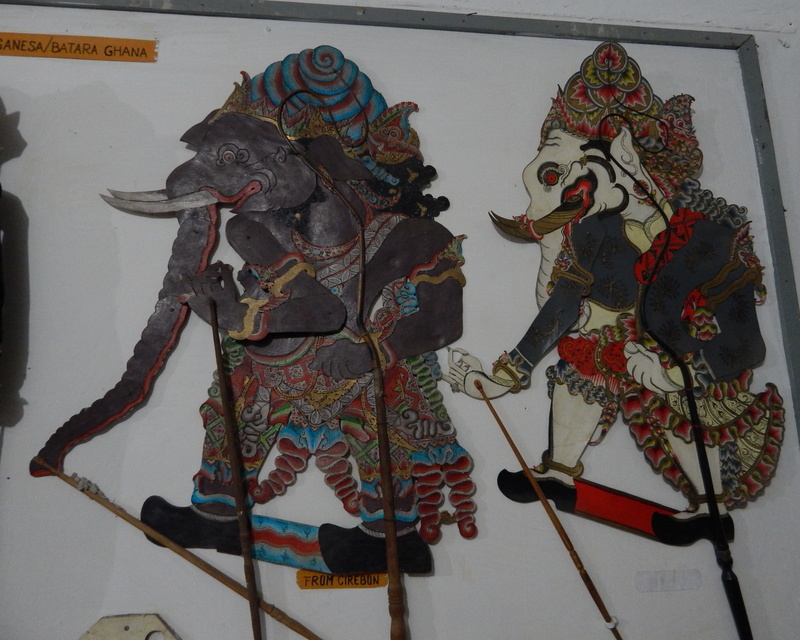 “Trunk” stories (pokok, galur, or pakem) tell of the births, major marriages, and deaths of the heroes. “Branch” stories (lakon carangan) elaborate on the central episodes and are considered less set than “trunk” stories but still established. The final group is “twig” (ranting) or invented stories (karangan). 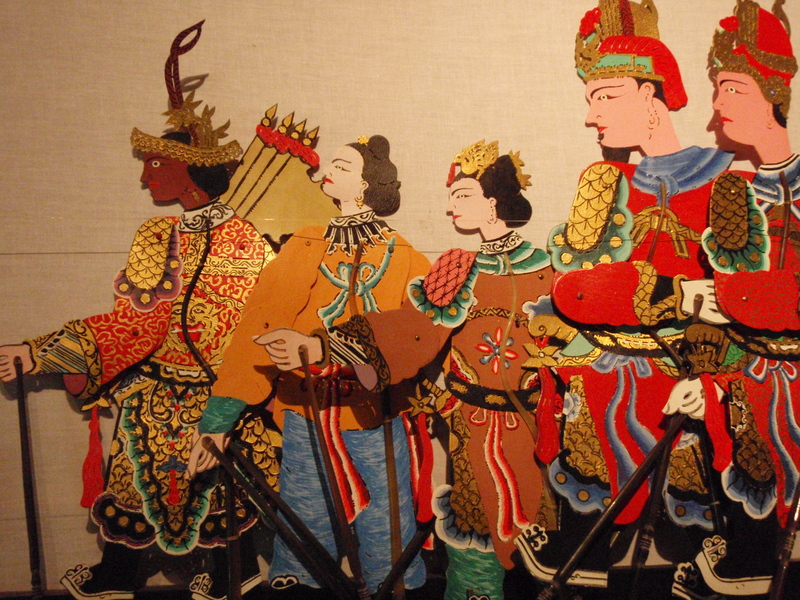 These episodes still use the same heroic characters but in them dalang are free to invent new lovers for heroes to embrace or battles that they endure. 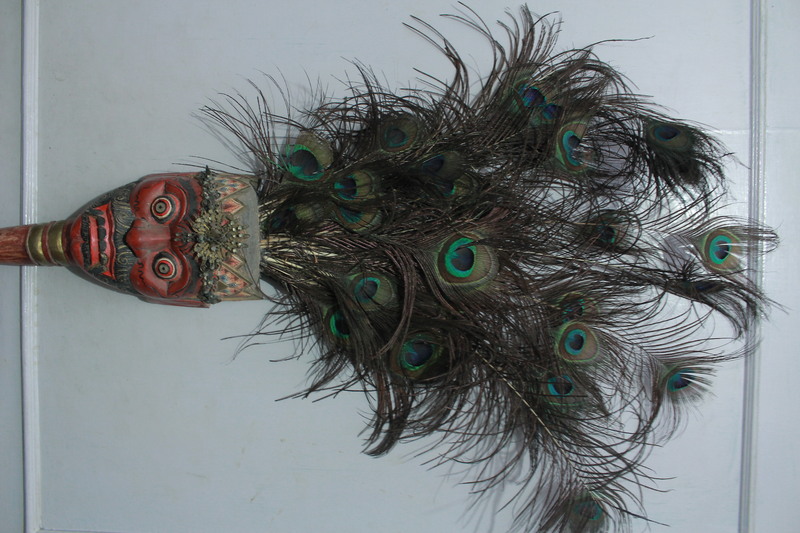 When a lakon karangan is particularly popular it may be adopted by other dalang and over the course of time a story may gradually become canonical. 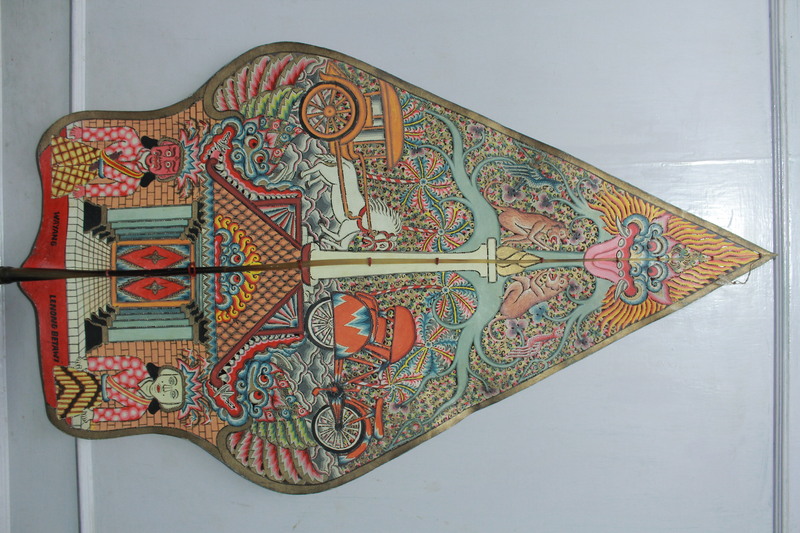 Ki Nartosabdho (1925-1985) was an important Javanese dalang of the 20th century who developed many lakon karangan, which have been adopted by other dalang. 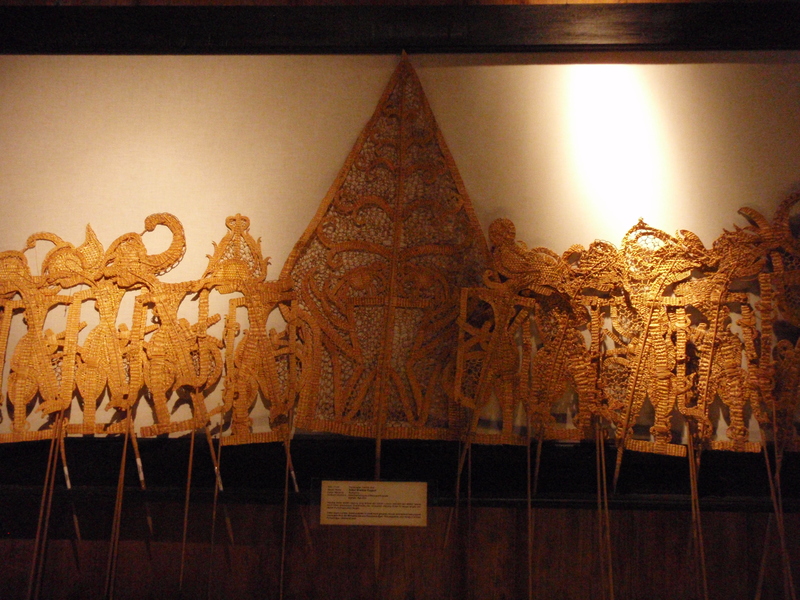 Dalang Ki Anom Suroto, Ki Manteb Soedarsono, Ki Timbul Hadiprayitno, Ki Panut Darmoko, Ki Purbo Asmoro, and Ki Enthus Susmono (Ki is an epithet of respect accorded to a senior dalang) are among the top performers well known all over Java today. 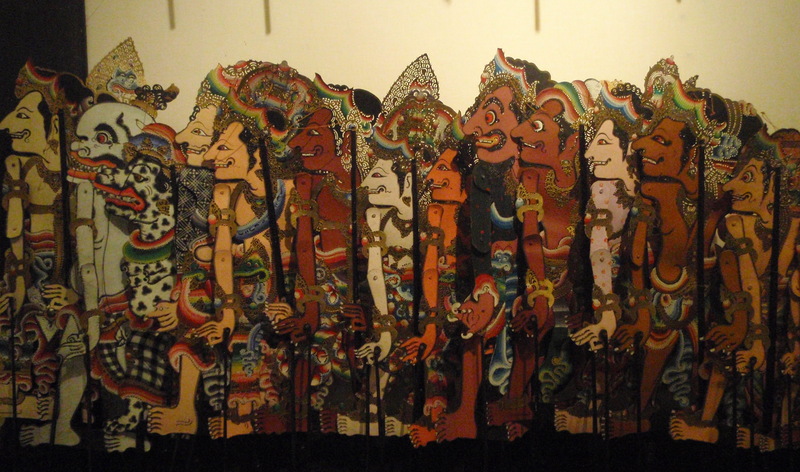 Experiments in scripted wayang in Indonesian language (wayang sandosa/wayang padat) or ones using multiple puppeteers and an expanded screen have emanated from ISI Surakarta (Institut Seni Indonesia, Indonesian Institute of the Arts, Surakarta campus). 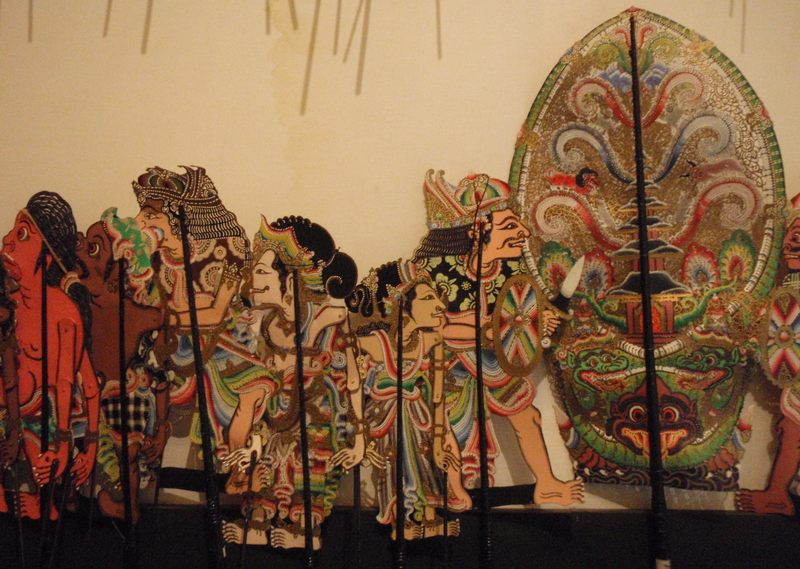 In Yogyakarta, Dalang Ki Sukasman (Sigit Sukasman) has been an innovator in both puppet making and performance, which uses coloured lights, multiple manipulators, dancers, and multiple screens. 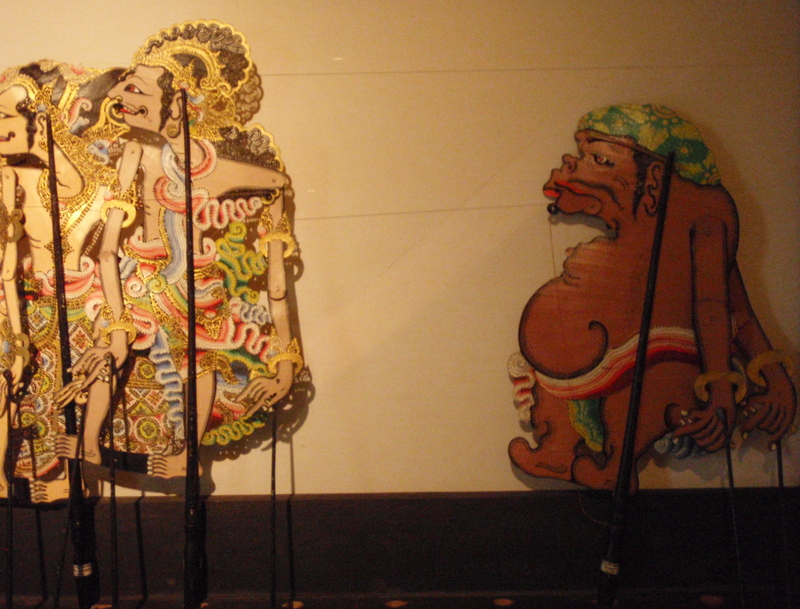 Dalang Ki Jitheng Suparman and Ki Slamet Gundono are among the most avant-garde performers. 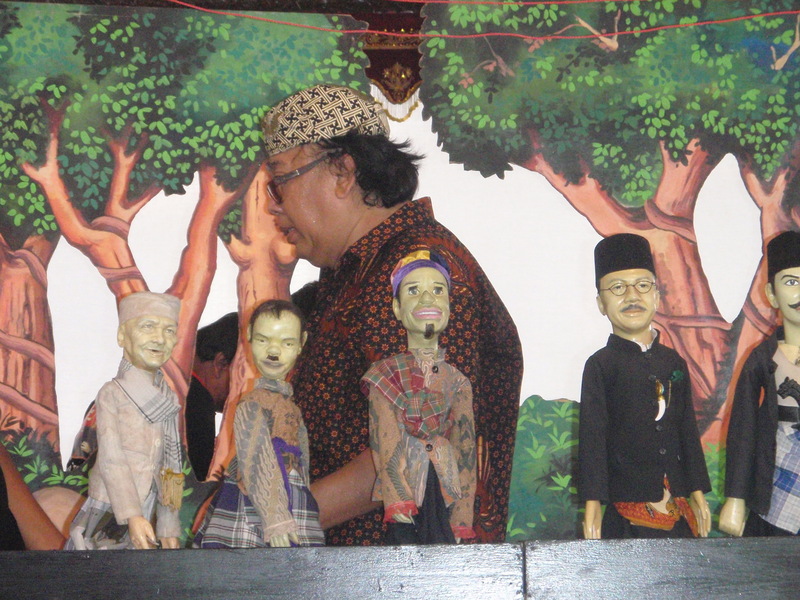 While Ki Ledjar Subroto, Javanese wayang kulit dalang, is also creator of children-oriented wayang kancil telling mouse deer fables. 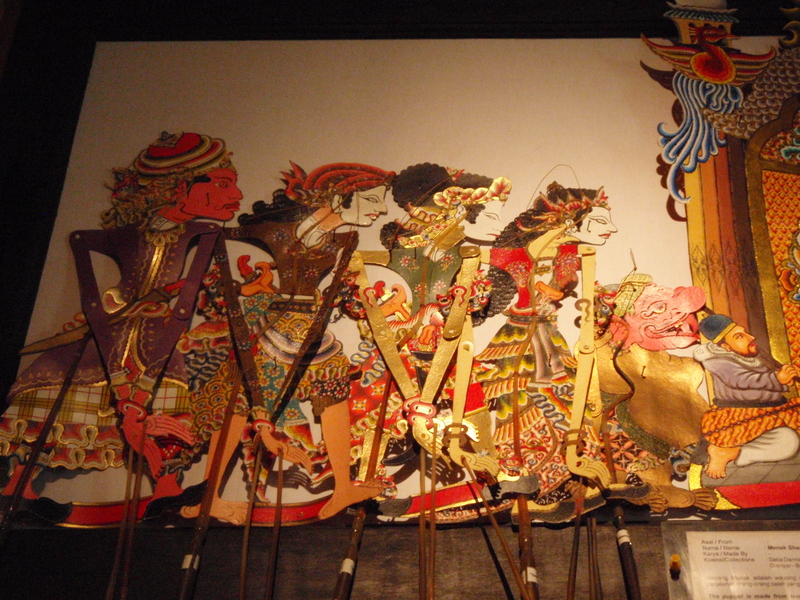 But most dalang continue to perform the more traditional wayang kulit purwa jawa. Mass mediation was an important feature of the last quarter of the 20th century and cassettes of popular dalang were readily available in stores or heard on radio or television. 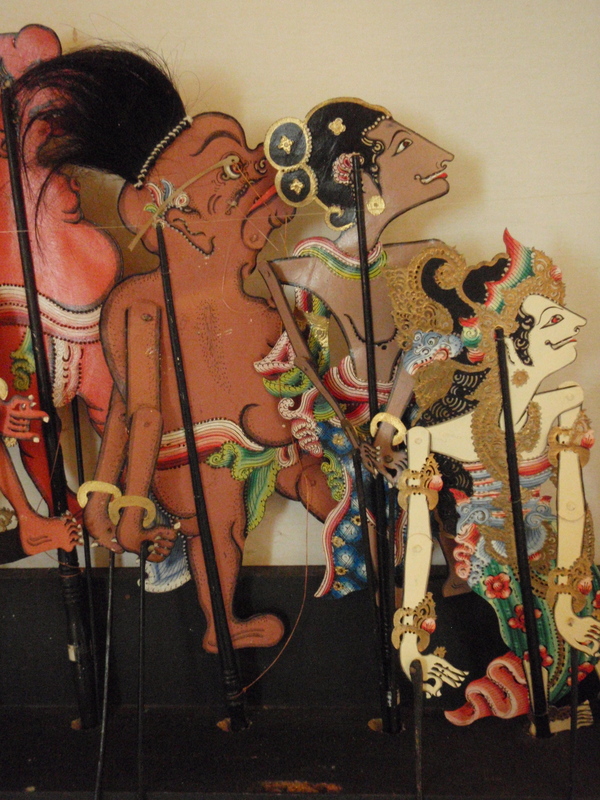 More recently, wayang kulit performances have become more and more spectacular, with additions such as dozens of beautiful female singers, a gamelan-hybrid pop music called campursari, three screens, three dalang, or stand-up comedians. 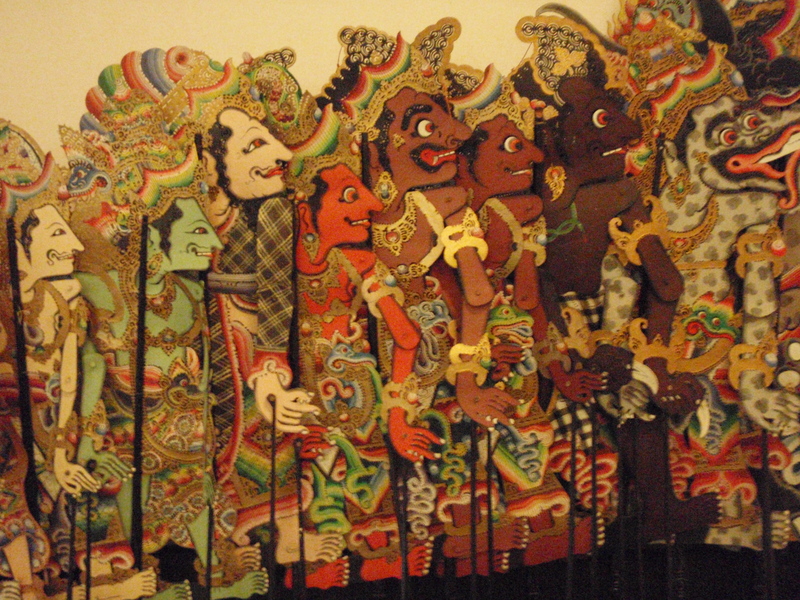 The third major language group practising wayang today is the Sundanese speakers of West Java. 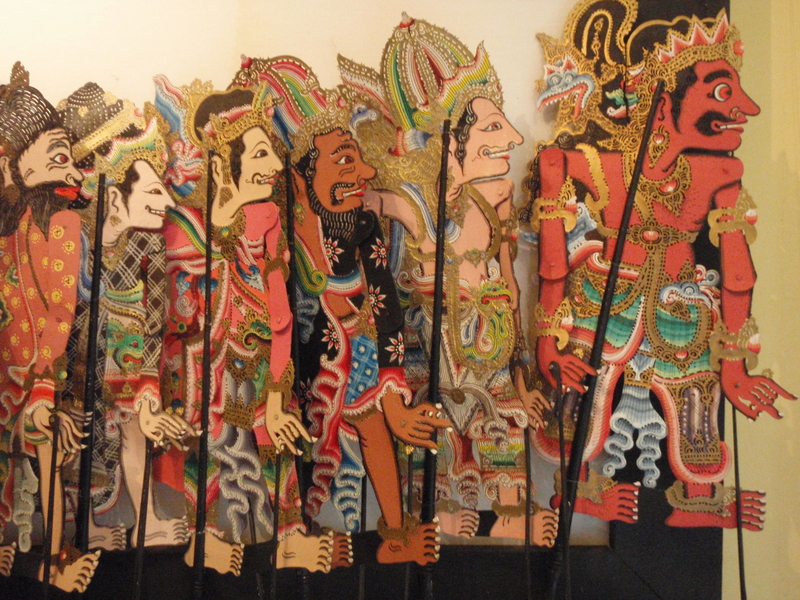 Wayang golek purwa sunda uses wooden rod puppets and Sundanese language to present Mahabharata or sometimes Ramayana stories. 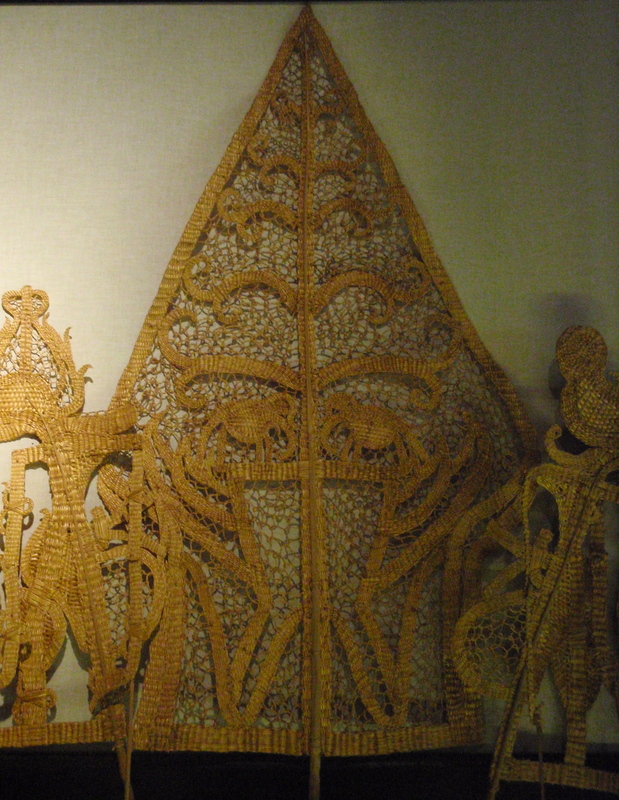 Most dalang in Sunda are descended from Javanese speaking performers who migrated to the highland in the 19th century. 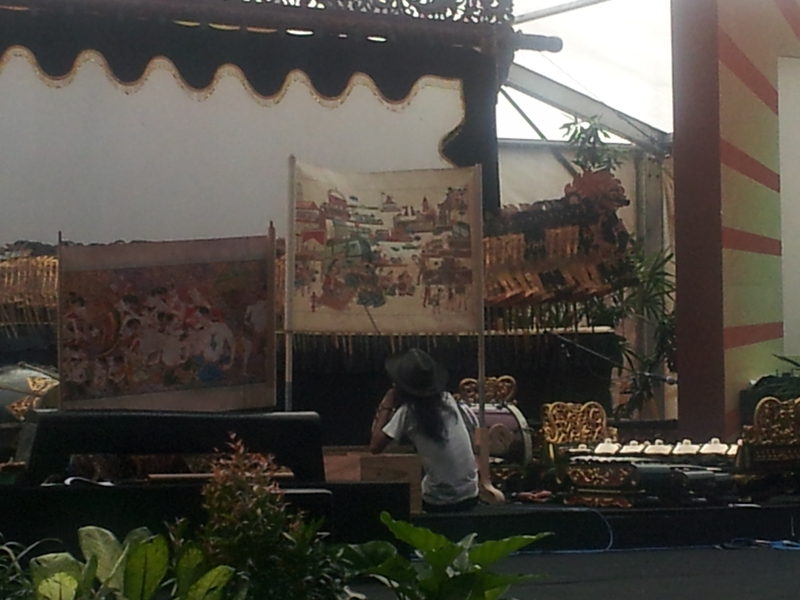 Dalang present out of doors in a performance of about six hours on a raised platform built for the event. A horizontal banana log is used as the playing board. 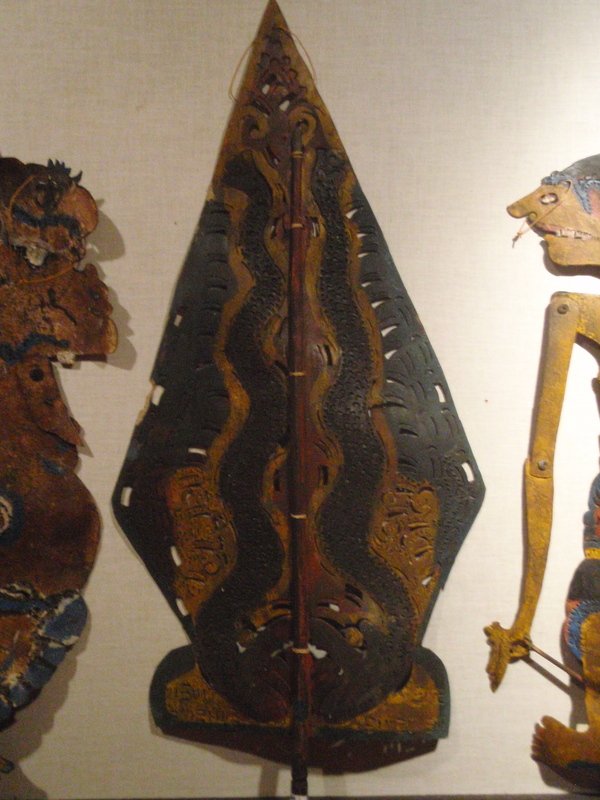 The 30-50 centimetre figures have a central rod on which the body and head sit. 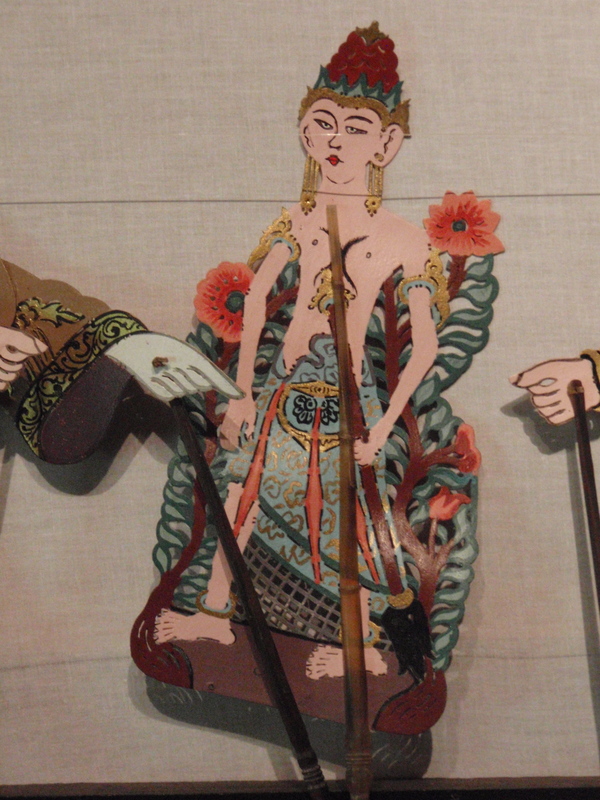 Two additional rods attach to the wrists of the three dimensional wood figure. 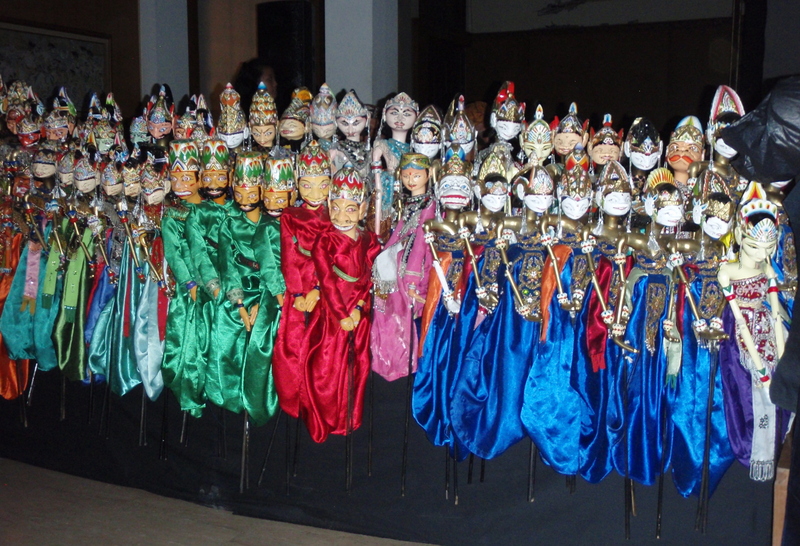 Very dynamic and lifelike movement is possible and thirty puppets may be used in a single show. 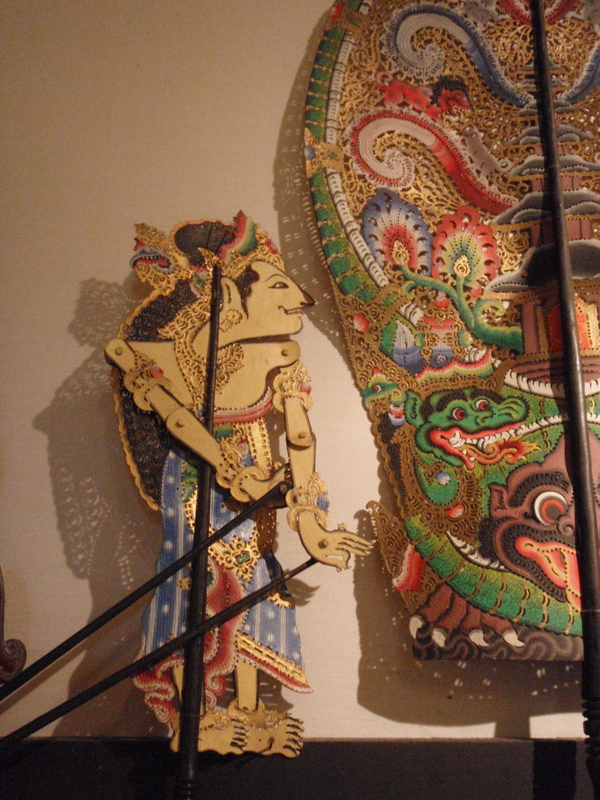 The gamelan has fewer instruments than in Central Java and the puppet master always brings all his own instruments and players. 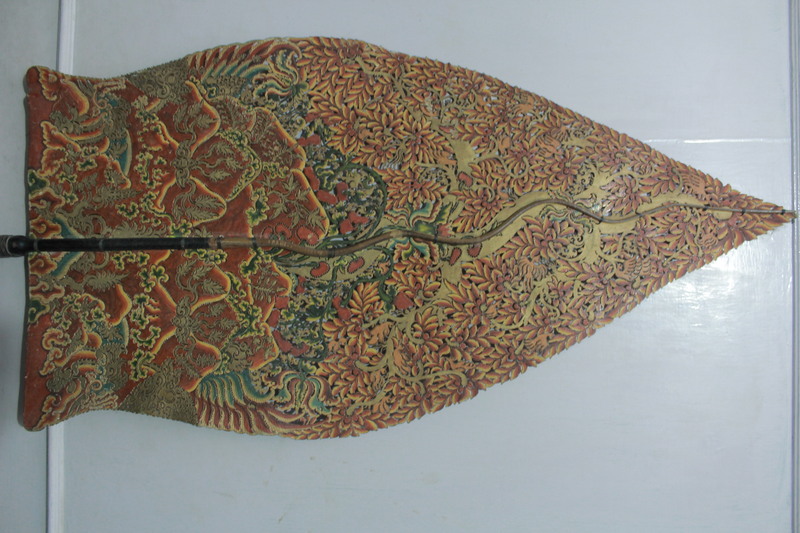 The performance structure is more flexible than in Central Java but will usually begin with the tree of life dance followed by a mantra called a murwa preceding the opening court scene. After various complications the action will move to a clown scene, which may take place in a hermitage, and the hero is introduced. By the end of the evening the performance climaxes in a final battle. 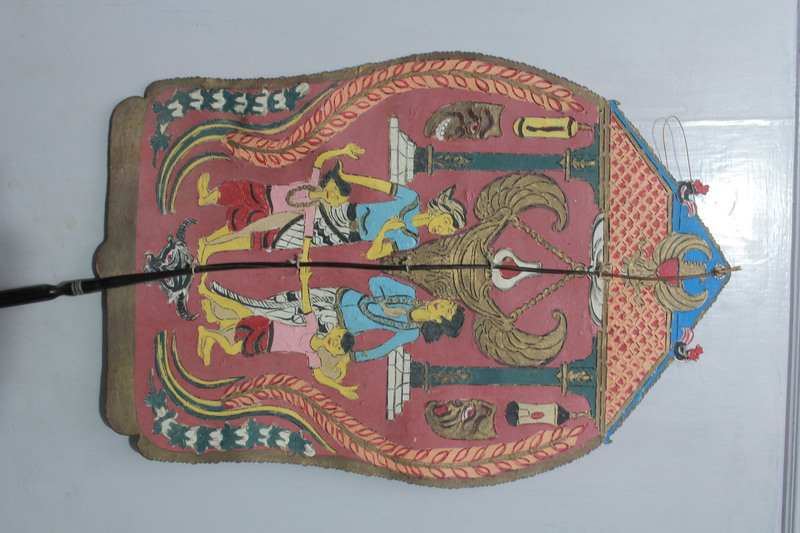 As in Central Java, performances are hired by a patron to celebrate weddings and circumcisions and viewers watch without payment. Hotel performances or ones commissioned by the local radio station do charge a modest entrance fee, but such performances attract relatively few. 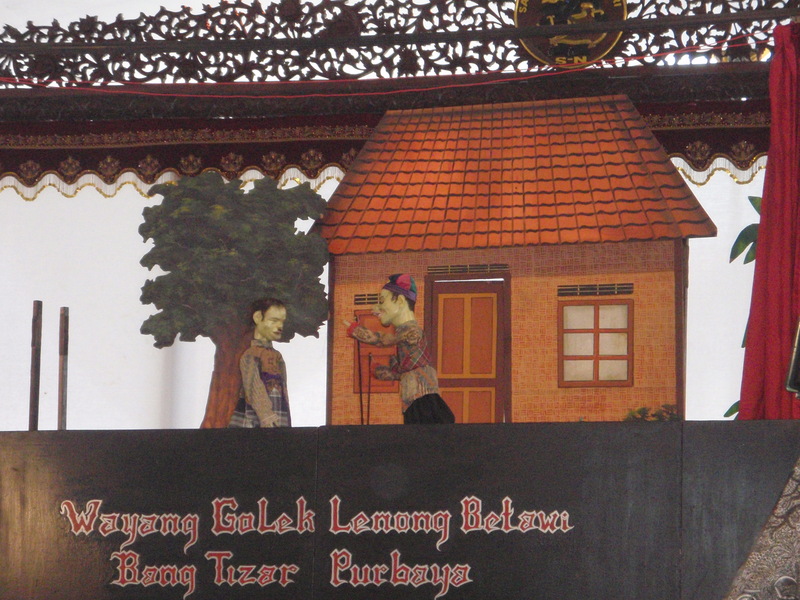 Performances in villages by the top artists may draw thousands to enjoy the artistry of “box office” dalang like the late Ade Kosaih Sunarya, Tjetjep Supriadi (also spelt Cecep Supriadi), Dede Amung Sutarya, Wawan Gunawan or the most famous of all Sundanese performers, the late Dalang Asep Sunandar Sunarya. 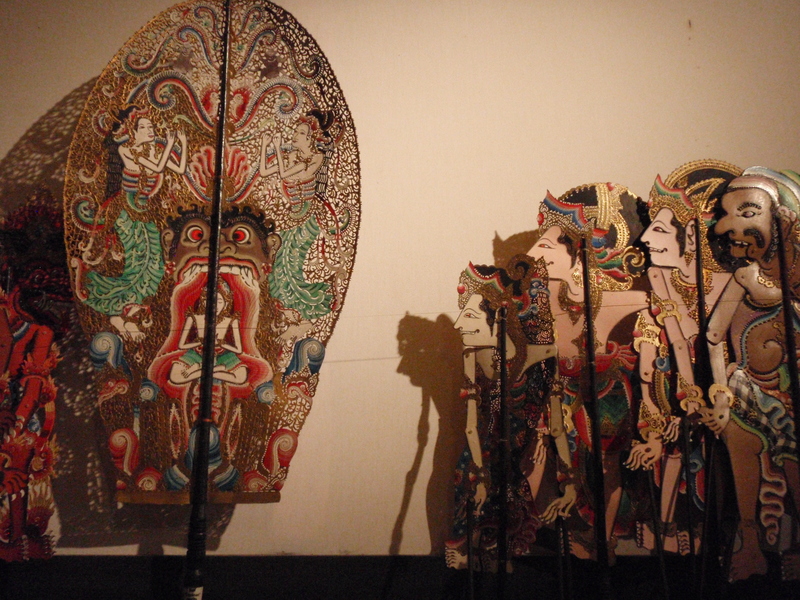 In Sunda, experiments at STSI Bandung (Sekolah Tinggih Seni Indonesia, Indonesian College of the Arts), now ISI Bandung (Institut Seni Indonesia, Indonesian Institute of the Arts, Bandung campus), have allowed drama students to revisit wayang in the contemporary theatre classes of Arthur Nalan. 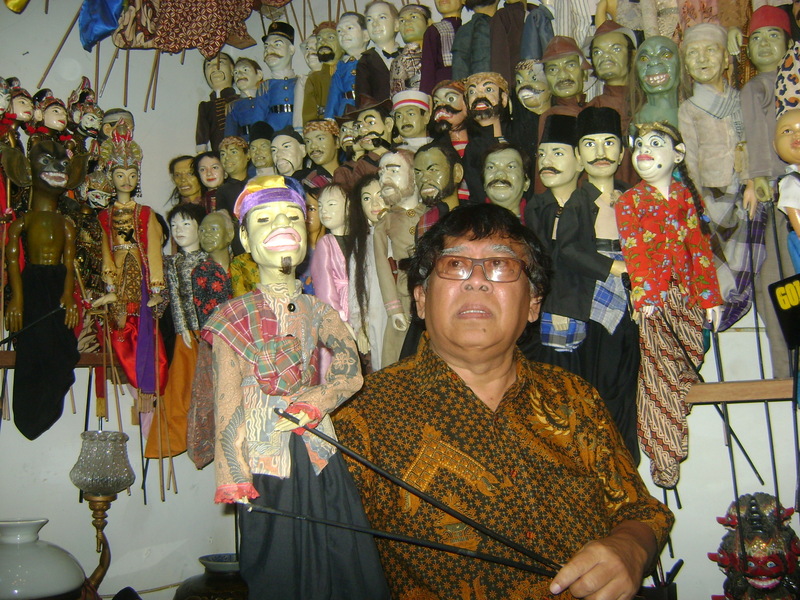 Since Indonesian Independence in 1945, the government has attempted to enlist puppeteers to national initiatives. 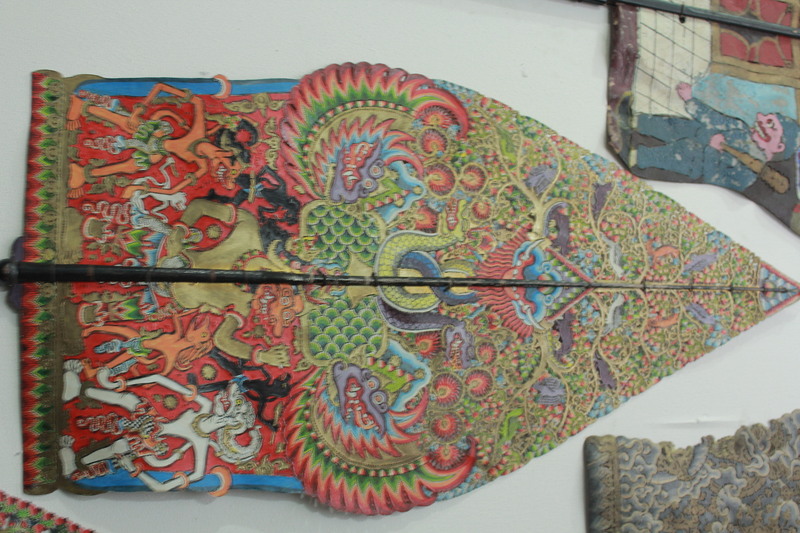 PEPADI (Persatuan Padalangan Indonesia, Indonesian Union of Dalang), founded in 1971, and SENAWANGI (Sekretariat Nasional Pewayangan Indonesia, National Secretariat of Wayang), founded in 1975, are pan-Indonesia organizations of dalang, which attempt to systematize and guide the art. 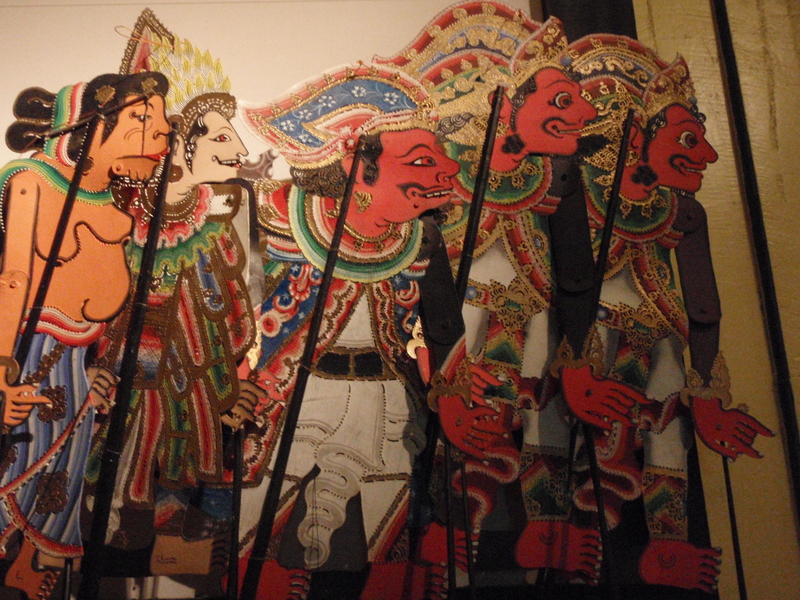 Organizations like these sponsor festivals of wayang, create written materials for dalang to study as models, and represent the art internationally. 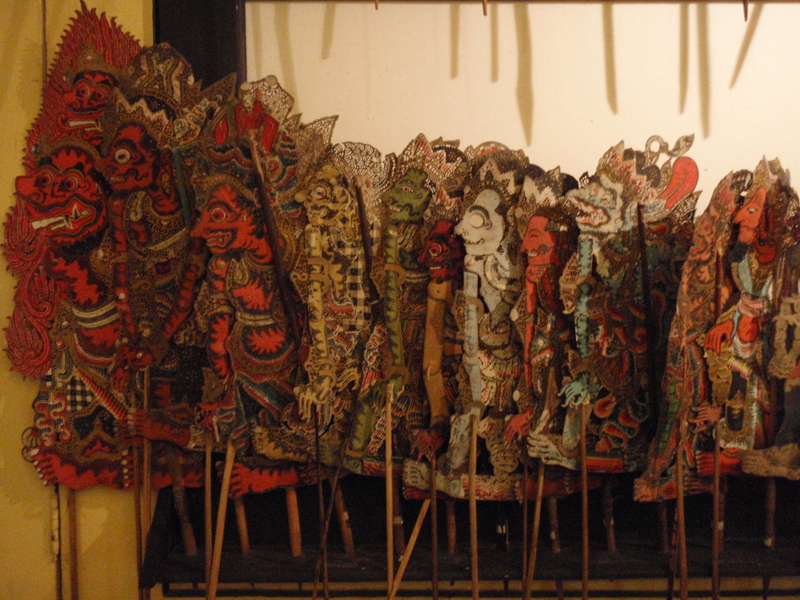 Such activities resulted in wayang being declared a Masterpiece of the Oral and Intangible Heritage of Humanity by UNESCO in 2003. 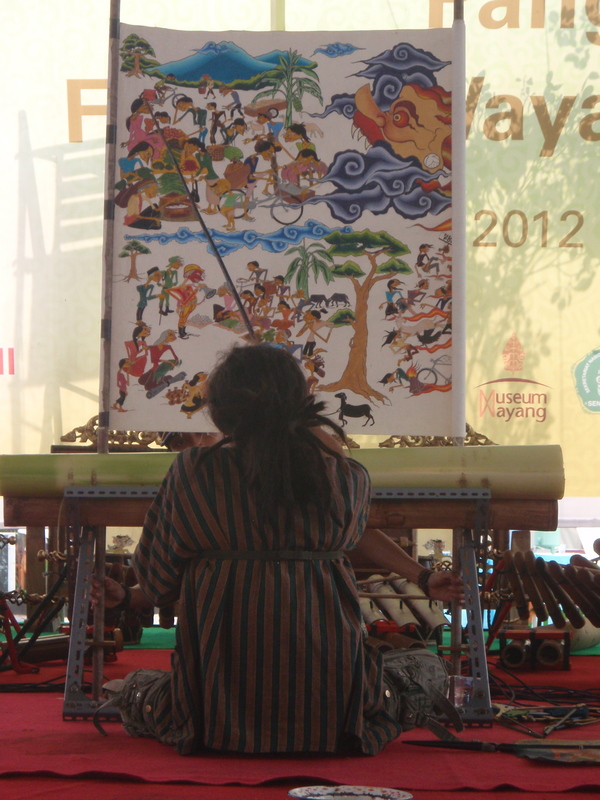 But despite attempts at uniformity, regional pride, language and culture keep the art distinct by cultural area. 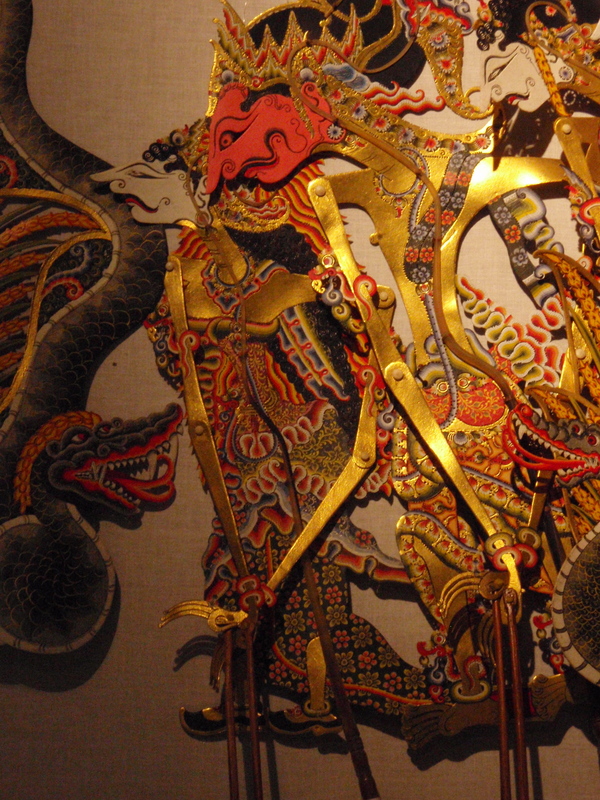 Since the late 1960s, foreign artists have trained in wayang traditions and carried various styles back to their country or developed new offshoots. 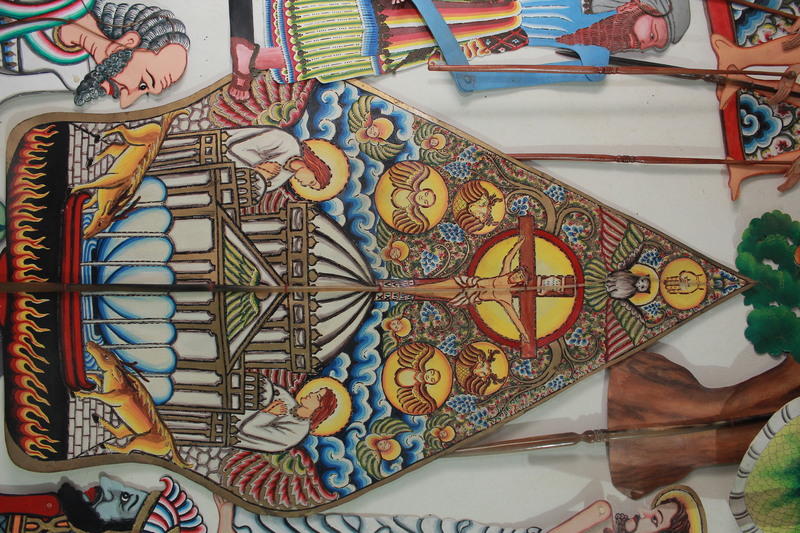 These artists and the tradition they carry on include Americans [lier]Larry Reed (Bali) Marc Hoffman (Java), Matt Cohen (Cirebon), and Kathy Foley (Sunda), British artist Sarah Bilby (Java) and Australian Helen Pausacker (Java), among others. 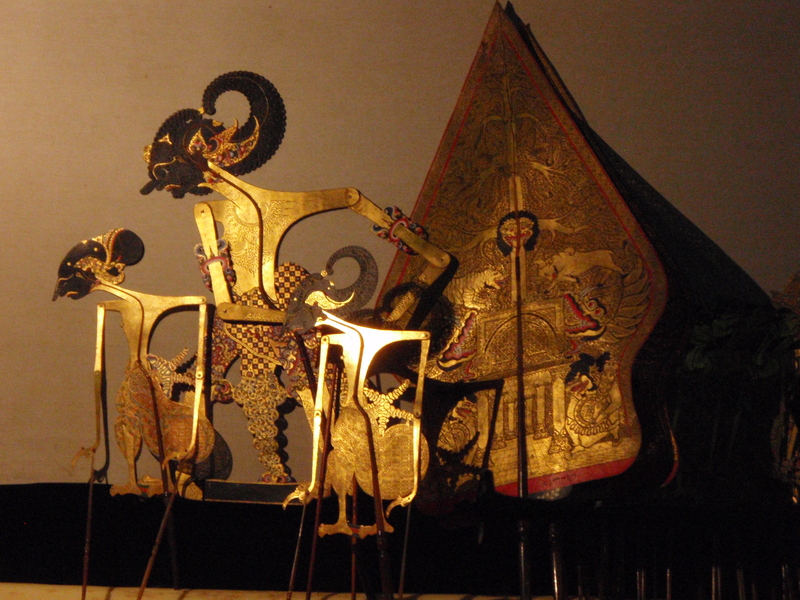 Modern collaborations of composers (Lou Harrison, Evan Zipyorn) in the international gamelan movement with Indonesian dalang are also part of recent innovations in a wayang which is diverse and yet flexible, which keeps many older features even as it embraces the new. Anderson, Benedict. 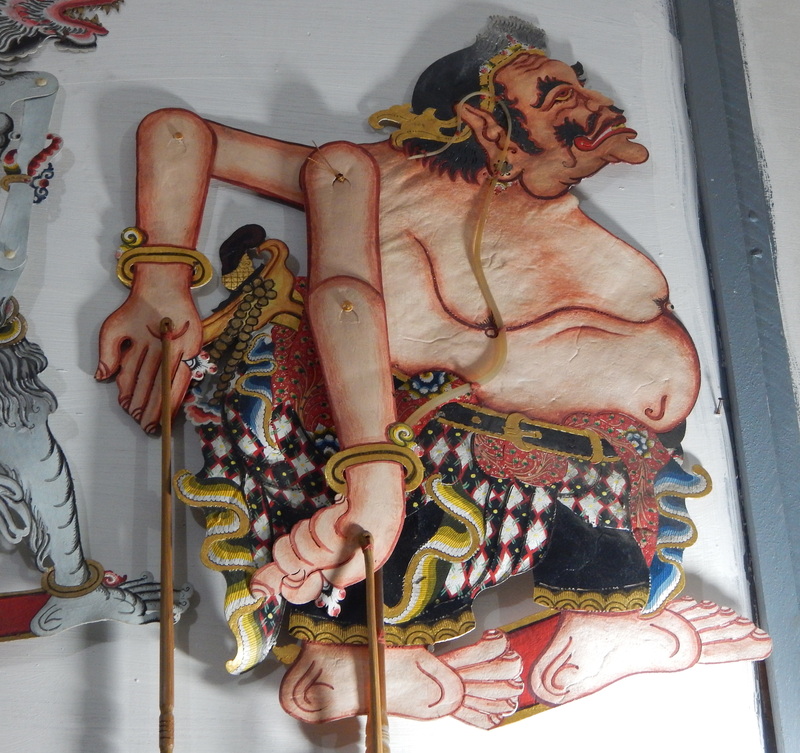 Mythology and Tolerance of the Javanese. 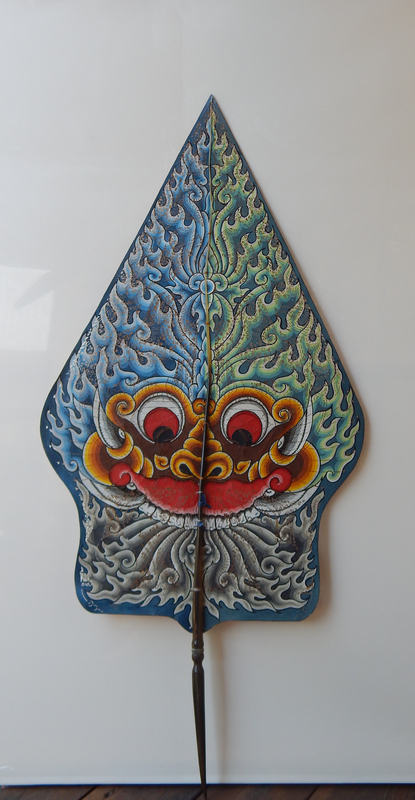 Ithaca (NY): Cornell University Modern Indonesia Project, 1965. Brandon, James. 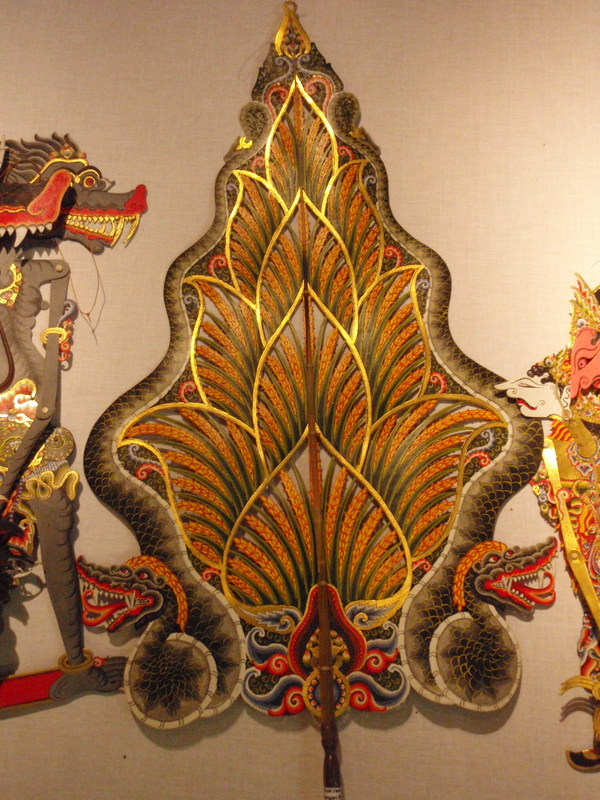 On Thrones of Gold: Three Javanese Shadow Plays. Cambridge (MA): Harvard Univ. Press, 1970. Clara von Groenendael, Victoria. 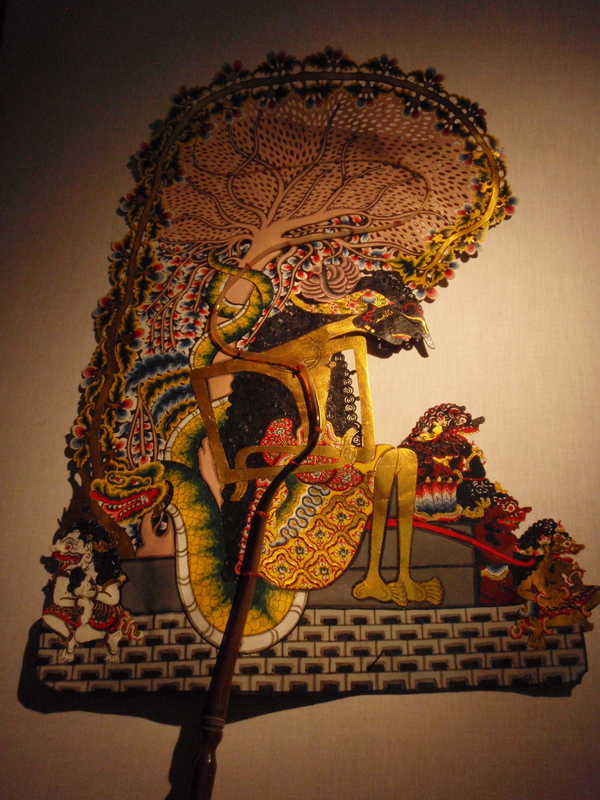 The Dalang Behind the Wayang. Dordrecht: Foris Publications, 1985. Foley, Kathy. “Indonesia”. 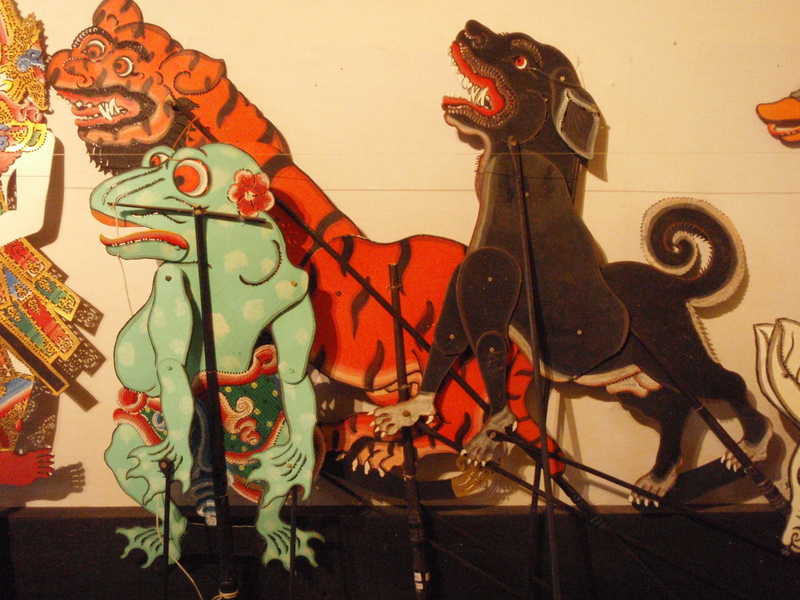 Cambridge Guide to Asian Theatre. Ed. James Brandon. Cambridge: Cambridge Univ. Press, 1993. Foley, Kathy. 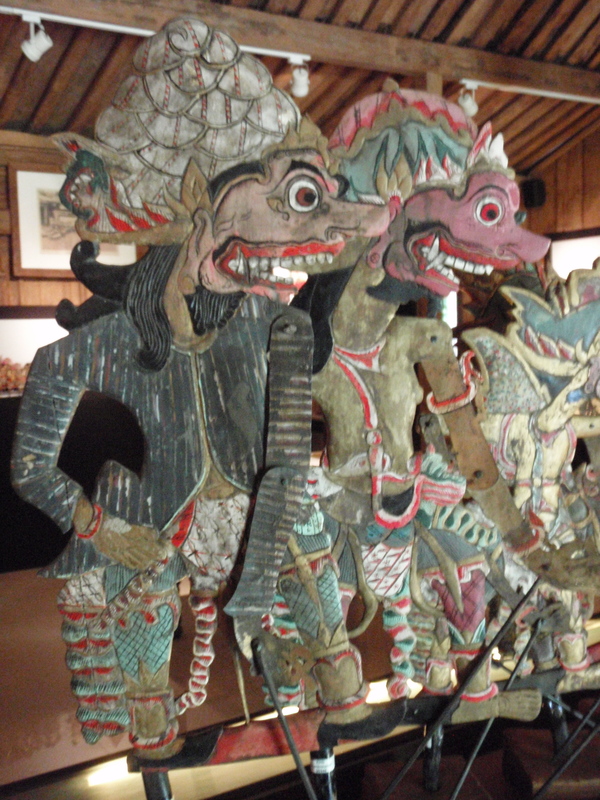 “The Sundanese Wayang Golek: Rod Puppet Theatre of West Java”. PhD Diss. University of Hawaii 1979. Holt, Claire. 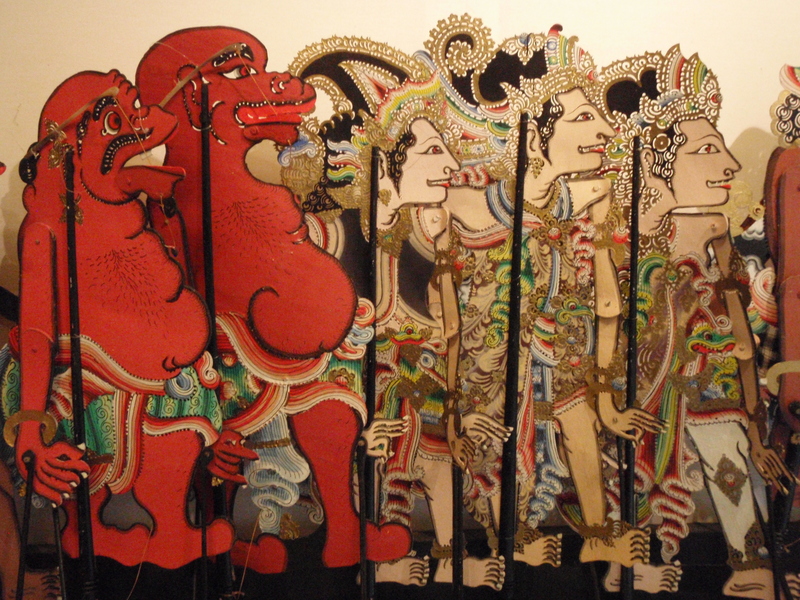 Art in Indonesia. Ithaca (NY): Cornell Univ. Press, 1967. Indonésia. 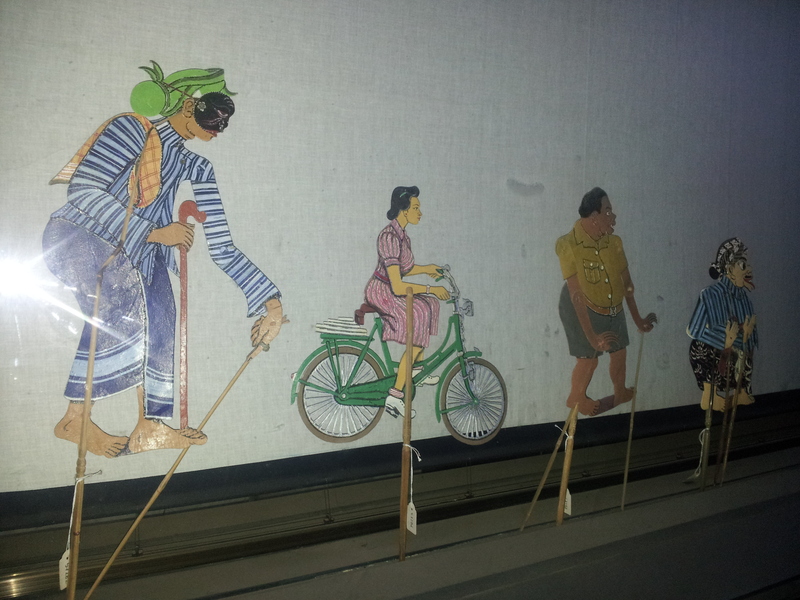 Le wayang. Paris: Ambassade de la République d’Indonésie en France, 1972. Moebirman. 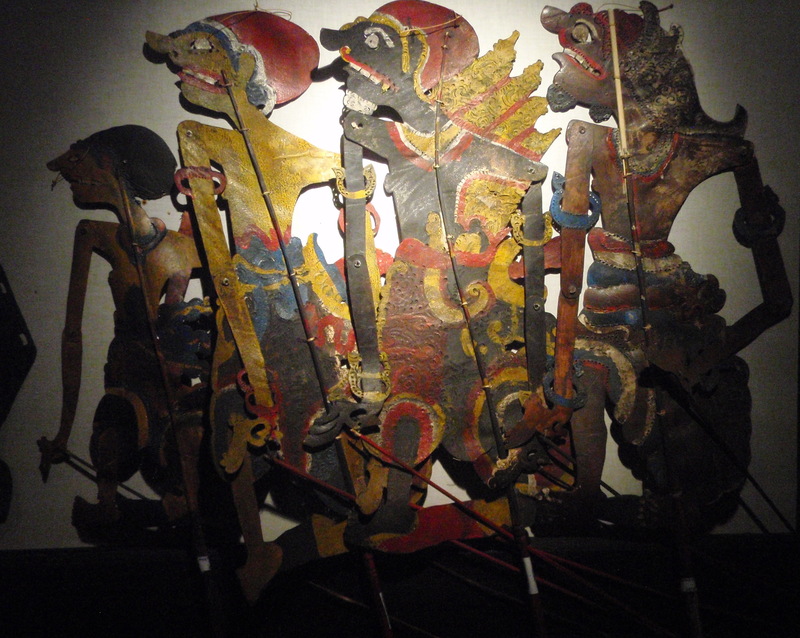 Wayang purwa. 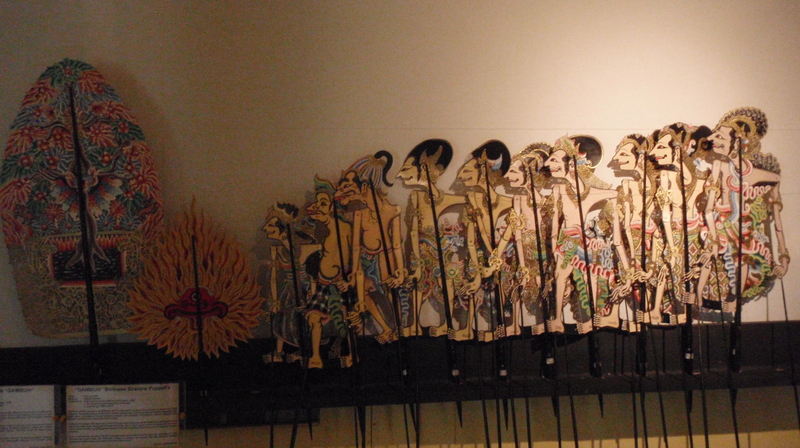 Introduction, origine, representation [Wayang Purwa. Introduction, Origins, Performance]. Djakarta: Éditions Ichtar, 1961. Pigeaud, Theodor. 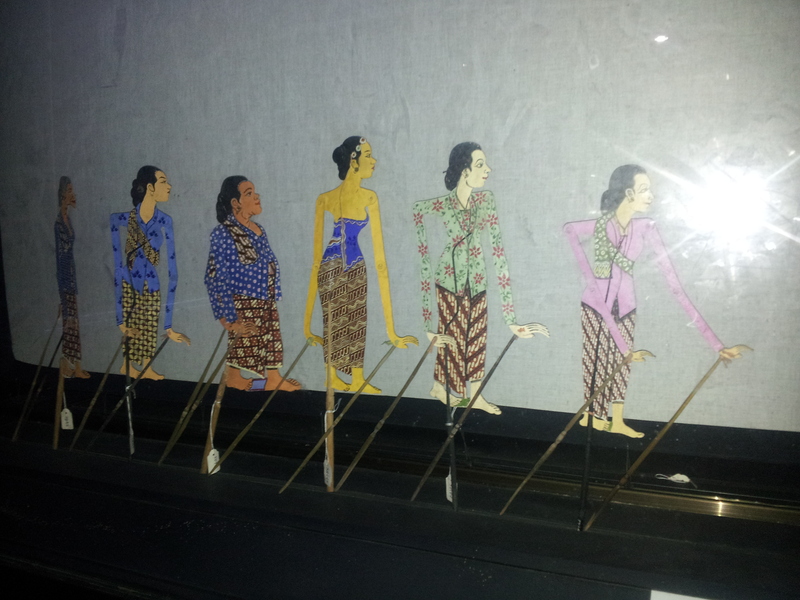 Javaanse Volksvertoningen [Javanese Folk Impressions]. Den Haag [The Hague]: Martinus Nijhoff, 1938. Sears, Laurie. 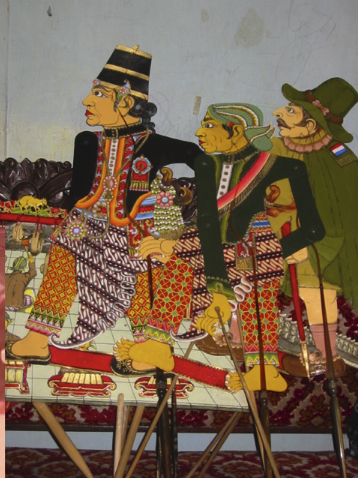 Shadows of Empire: Colonial Discourse and Javanese Tales. Durham (NC): Duke Univ. Press, 1996. Spiller, Henry. 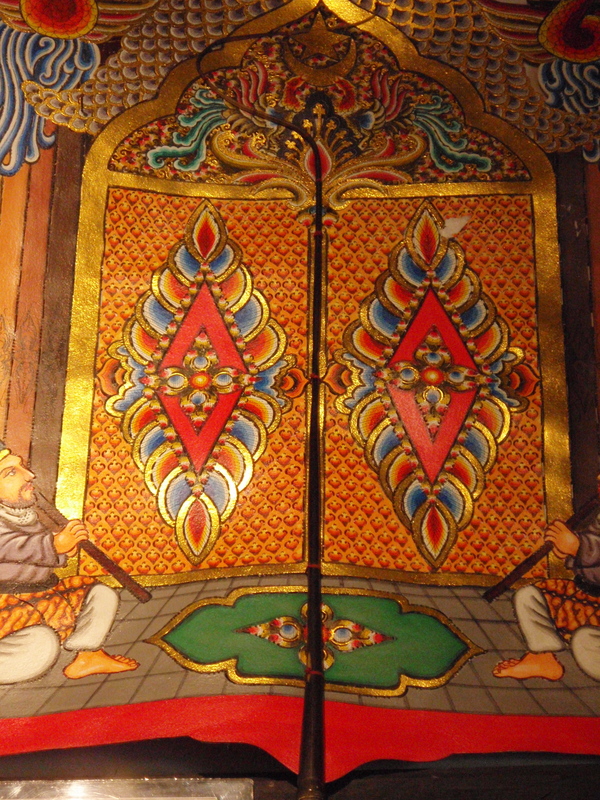 Gamelan. 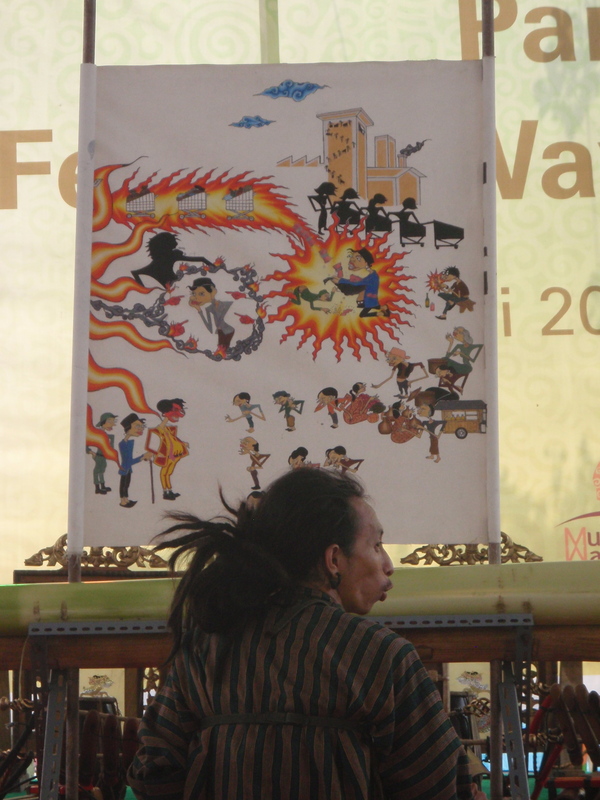 The Traditional Sounds of Indonesia. Santa Barbara (CA): ABC Clio, 2004. Weintraub, Andrew. 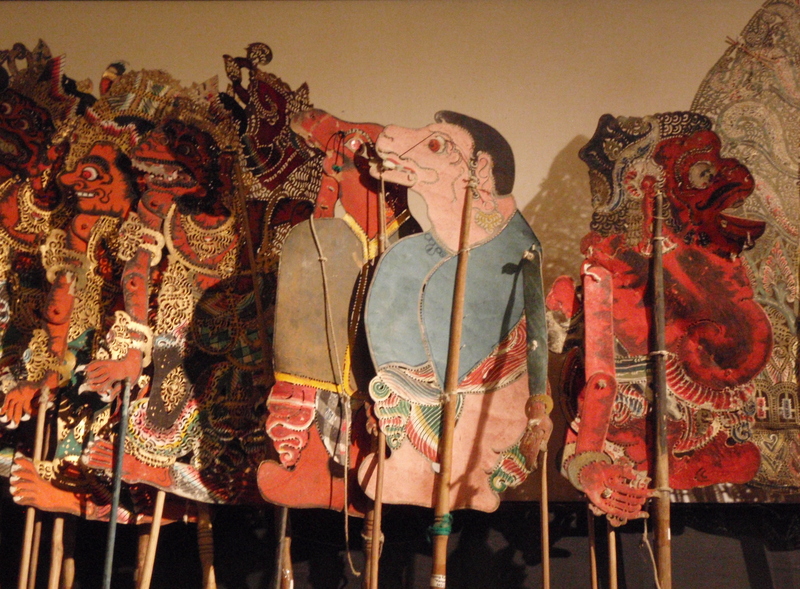 Power Play: Wayang Golek Theater of West Java. “Research in International Studies: Southeast Asia Series”. No. 110. Athens (Ohio): Ohio Univ. Press, 2004.